I had a lot of fun with the ISF at its first trackday. Bottom line: the ISF got down to 1'10.2, which is only a wee bit slower than the FD was at 1'09.9. And I have to remember that the FD was on really good Endless MX72 pads and Advan AD08R tyres at the time, so it isn't really comparing like with like. 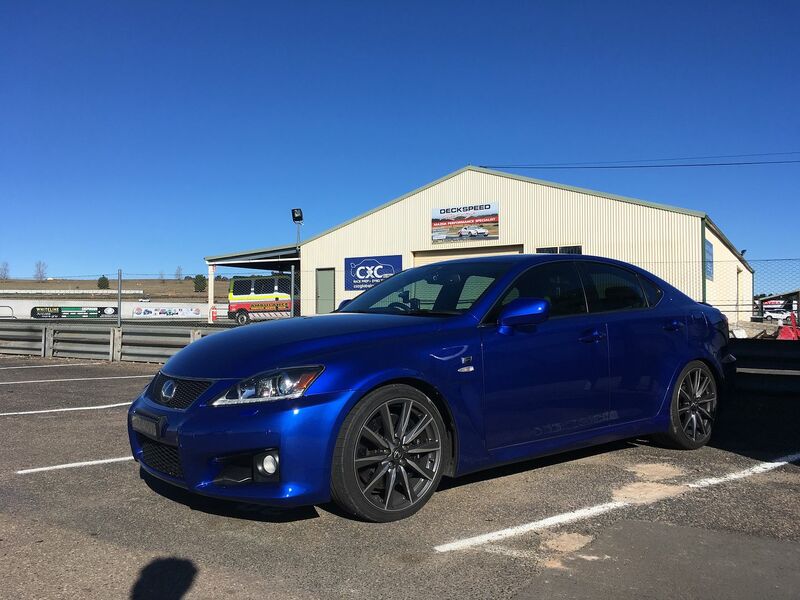 At the FD's very first trackday, it got down to 1'10.2 as well; but that was on Kumho KU36 tyres, which are many magnitudes better than the ISF's Michelin rubber on a racetrack. So I reckon the ISF is good for a high 9 on road tyres and quite possibly a low 8 with proper tyres and brake pads. 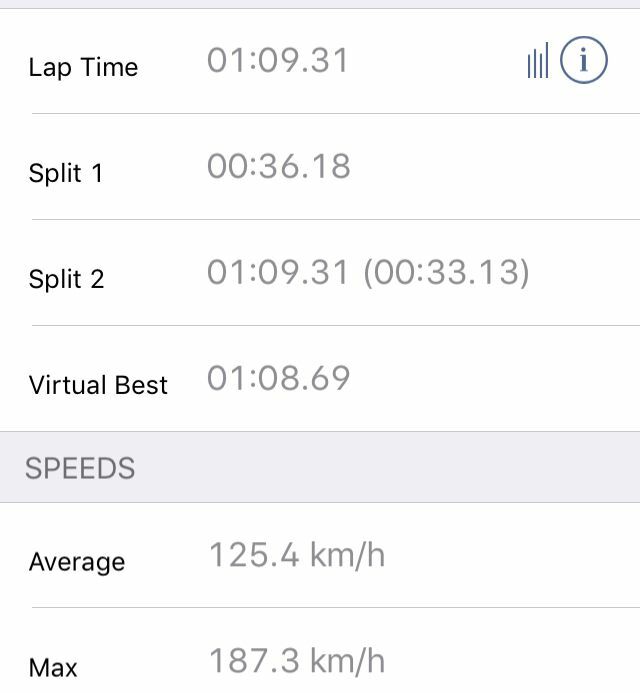 My fastest laps were with the driving aids in Sport Mode, which is to say that the traction control is slackened off and allows a little sliding. When I turned it all off, which I only did for one session; I was about a half second slower. 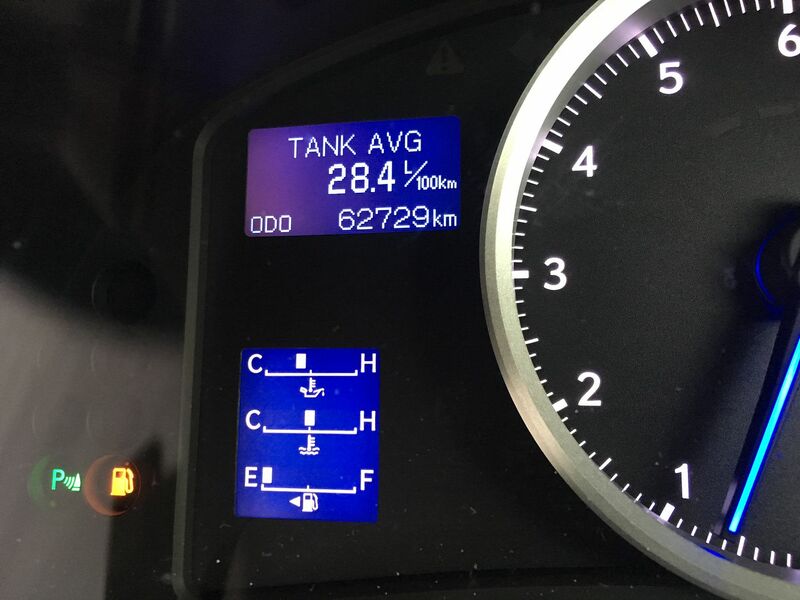 Starting from the left, the ISF is 10km/h up on the FD's top speed, with the ISF clocking 186km/h before braking. The lines then dive under brakes...ISF's braking point is a little bit earlier, but the big Brembos allow better modulation than the FD's brakes, so you can see that I'm bleeding off the brakes a bit better and getting a slightly better corner entry speed. As the line rises again for the run up the hill, it's roughly line ball, but as the line goes down again for Turn 3-5, you can see that the ISF's trace is jagged, as it has to slow more for the corners, and then accelerate out. In comparison, the FD can take that whole section at a more constant speed, hence the red line is smoother as it heads to the second deep braking point. Then the line rises again, for teh run down the hill into the right hand sweeper, and you can see the FD's red line smoothly arc upwards, because the FD can turn into the sweeper with just a brief lift. The ISF needs a longer lift to settle the car, and so you can see the trace dip a little halfway up as the line climbs. Then it's hard on the brakes at the "1.21" point on the chart, which is the Bus Stop hairpin. The FD gets a higher entry speed, while the ISF brakes to a slower entry speed, but then you can see the ISF's brute force as it outaccelerates the FD up to the right hand sweeper on the back straight. As the line climbs to the final peak of the lap, again you can see the traces for both cars dip, as they back off to turn in for the sweeper, but there is a bigger dip for the ISF which needs a touch of brake, whereas the FD makes do with just a lift, with the FD recording a higher mid corner speed. Then finally the lines dive for the last time as the two cars brake for the final hairpin, with...surprisingly the ISF logging a higher mid corner speed...probably due to the slow point and squirt nature of the corner handing the advantage to the ISF, which gets a much better acceleration out from the apex. So overall the analysis isn't a huge shock; the light and nimble, good-tyre shod FD gets a small advantage in midcorner speed in the long corners, but it has a huge advantage in the series of tight corners (which is where it gains most of its advantage). The ISF wins the race out of the corners, but needs to slow more for the entry, and the tighter the corner, the more it sees the FD motor away into the distance. But given that the tyres and brake pads of the ISF are nothing special, I'm a little shocked it's as fast as it is. The tyres are Michelin Pilot Super Sports, 225 at the front and 255 at the back. Exactly the same footprint as the FD, but the Michelins fade quickly on the track and it's hard to coincide the sweet spot of the tyres, with a clean lap with no traffic. 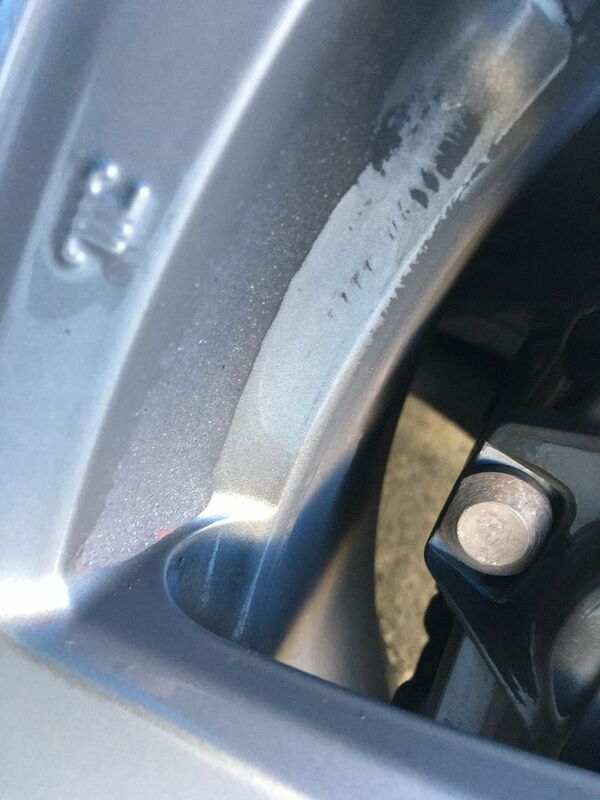 I'll upgrade to Advan AD08R when the time comes, and I'll upsize them to 245/275 which fits fine on the stock ISF rims, and should make a huge difference. The ISF brakes were the oem brembo pads I fitted a couple of days before the trackday. They were really good for the first two sessions, with huge, beastly retardation but after that they got a bit overtemped and began to wear out really fast. After 42 laps, the brand new pads got down to 2mm of pad material, and you could even see them getting thinner and thinner with each session The brembos are now in the bin, I'll do it right and get Endless MX72. It's a shame, the Brembos had great feel under road conditions. What's it like to drive? Well, first thing is that there's plenty of accessible power, and the 8spd snaps off aggressive shifts making the whole package feel pretty mighty. In a couple of corners where 2nd and 3rd were both useable, 3rd felt quicker, with enough low down torque to dig the car out of the turn...the top end power can be a bit spiky as it comes in and kicks the tail out, so going a gear higher felt like the better compromise. In terms of balance, it's great...very resistant to understeer, and power oversteer on corner exit is the dominant characteristic. It actually feels like it has more power than it can use, and you have to be quite progressive with feeding it in. And for a big ol' gal, it always hung in gamely and never felt like it would collapse into understeer, and it sure felt nimbler than its 1680kg would suggest, and it sure doesn't feel like a sedan. As for the driving aids, I was a bit slower with them all off, and only ran it this way for one session. There isn't the same feedback as the FD, and rather than ease into a slide smoothly, the ISF tends to transition into oversteer in a bit of a messy spill. So with everything turned off, it could be hard to walk the fine line between sliding just enough, and going way too far with a smoky drift; it was hard to find the middle ground, but maybe I just need more practice. Certainly the traction control is really well judged for track use, it would allow a little power oversteer, and keep the power on for a good drive out of the corners. 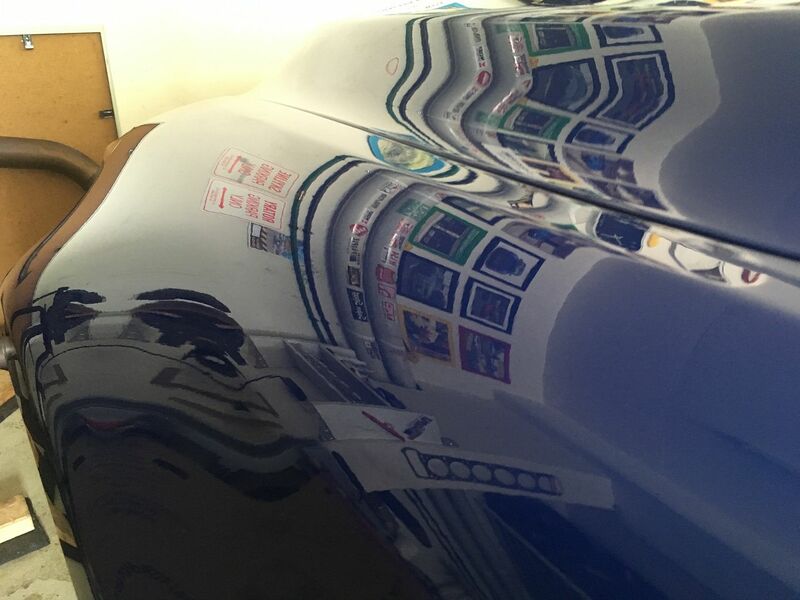 And you could even feel it straightening up the car, when I'd over-rotated it a little on the ripple strips mid corners. Pretty clever system, I think I'll need a lot more practice before I can better it. 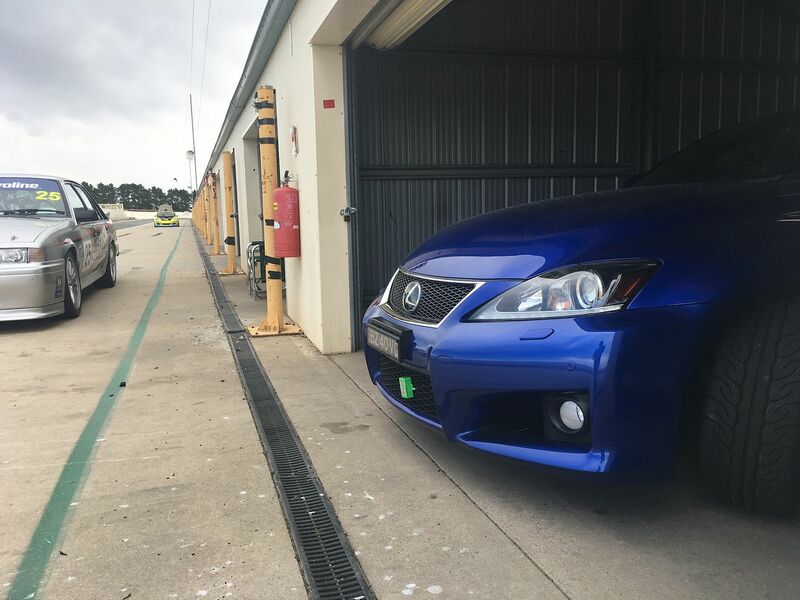 Double demerits and a long weekend seemed like a good idea to finally do something I'd been putting off since I bought the car, which is to apply the Gyeon Mohs paint coating. 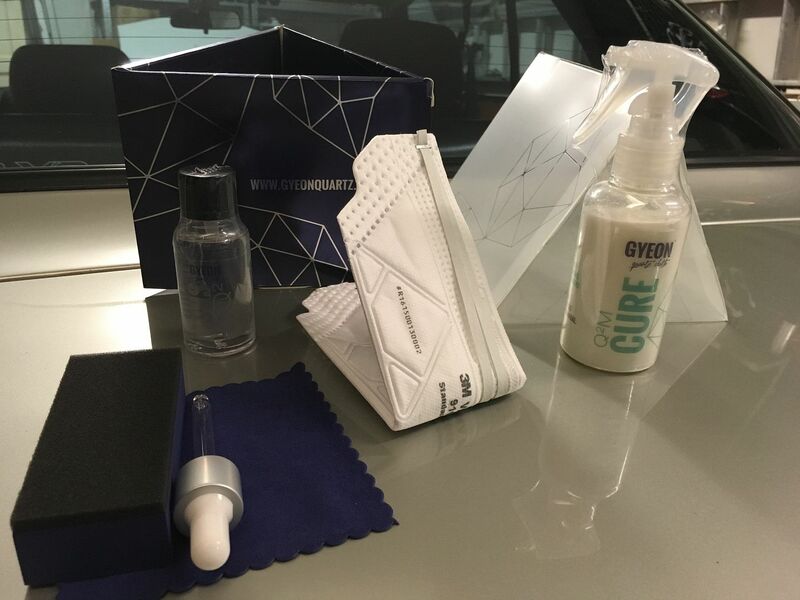 I'd done a paint correction on the car when I first got it, but as the Gyeon process takes 3 days (during which you can't move the car), at the time I was too busy driving it to bother. But it's high time I got off my arse to do it. 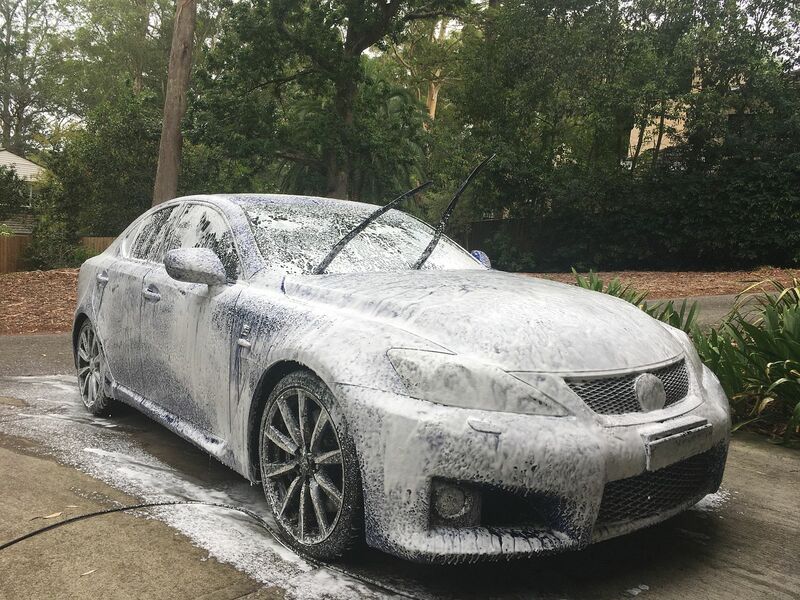 Stage 1 is to give the car a good wash.
And after rinsing the car, while it's still wet I clay it down to remove surface contaminants. I don't park it outside much, so it was still reasonably clean from last year's detail, and the claybar didn't pick up all that much. 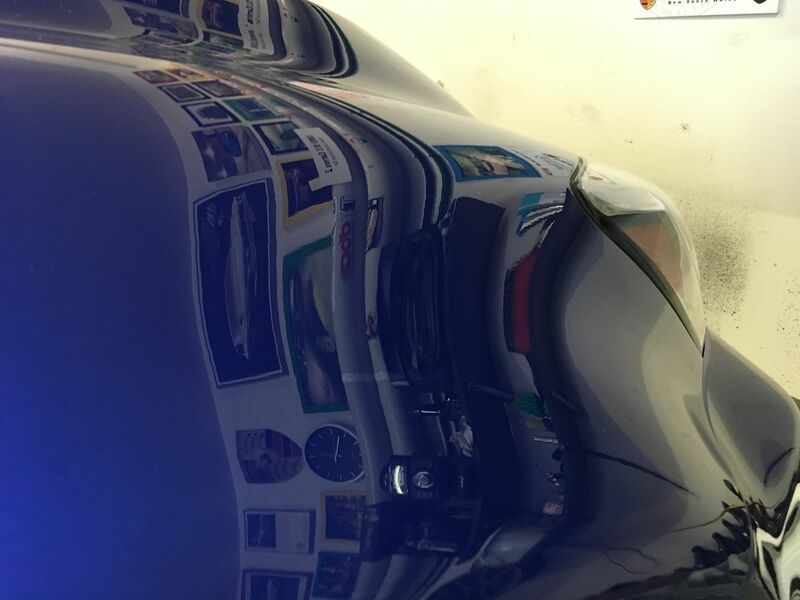 Once the car's dried, I can start on the polishing. And the first stage is the heavy cut. 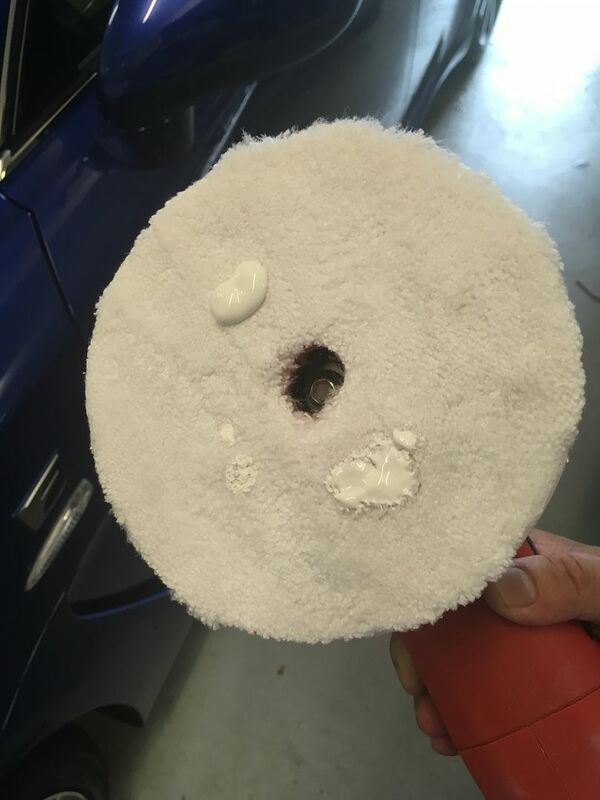 Only put a small amount on the coarse cutting pad (a little like a towel material)...this is enough to do a whole fender. 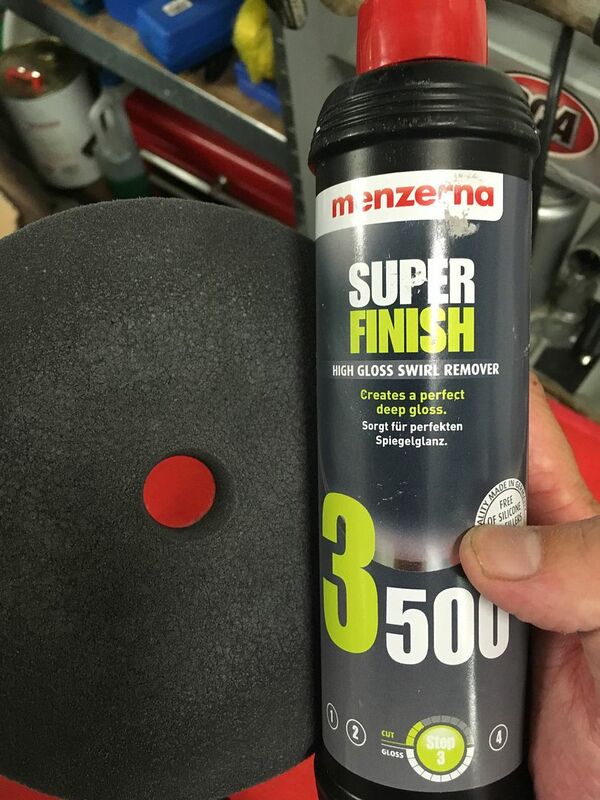 Dab the pad (with the polisher turned off) to distribute the polish around the panel. And then whizz it lightly around on the lowest speed setting, to spread the product in an even haze all over. 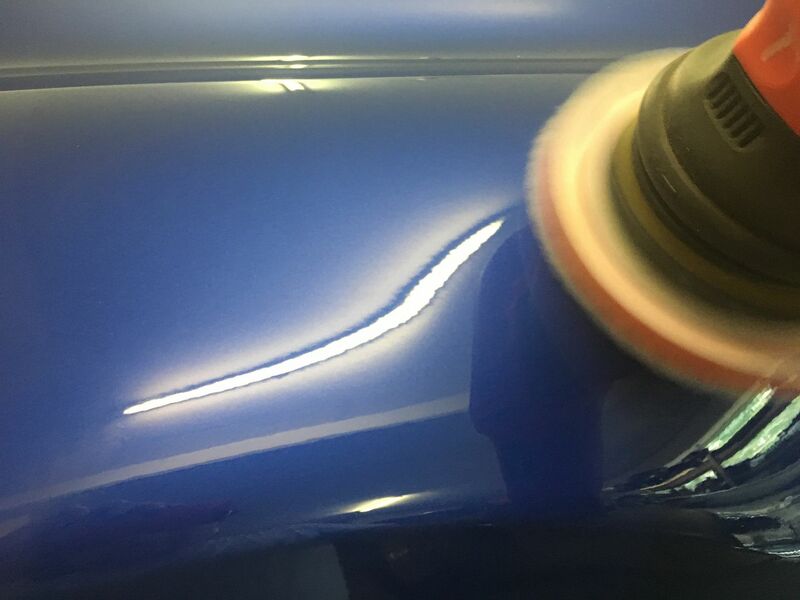 Once you have good coverage, turn the polisher speed up to max, and slowly move it around the panel in a criss-cross pattern. 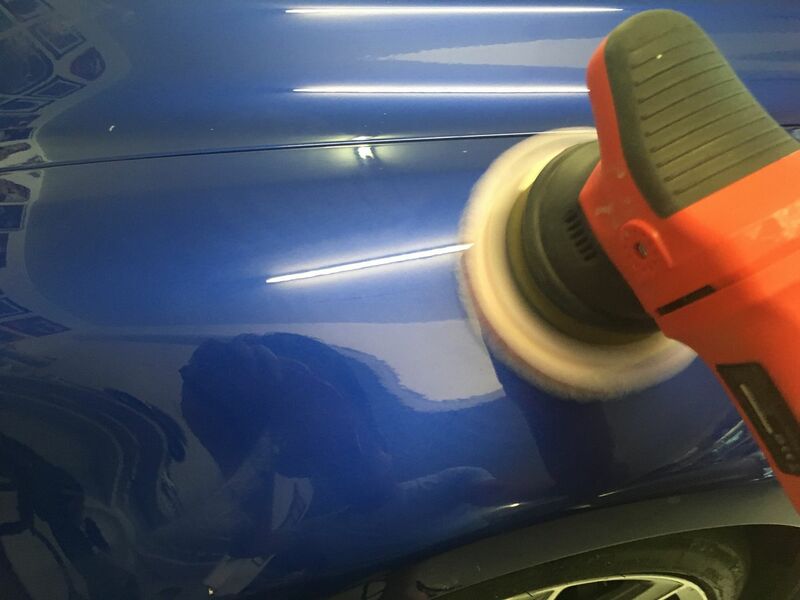 The polish should almost buff until it's clear, which means that the abrasives are broken down to a fine powder and have done what they need to do. Then buff with a cloth. At this point, it's pretty good. Any swirls are gone and the paint looks nice and deep. In a few spots where I noticed a bit of a scratch, I'd give it a few more goes with the heavy cut to make the scratch less noticeable. But it still has more to give. Next step is the medium cut, which is applied with a foam polishing pad. There's a bit of crusty old polish on the pad from when I did the Hako last, but it all comes off with a stiff brush. 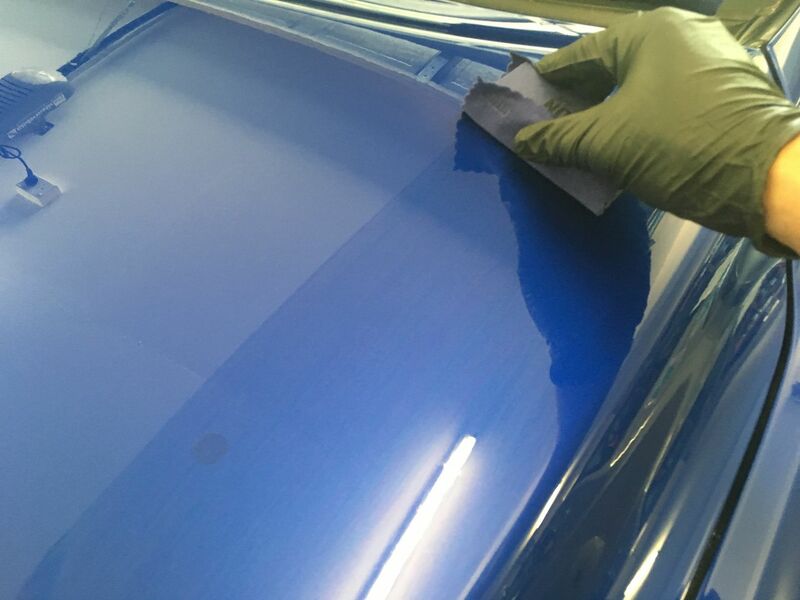 Same process to apply as before, and it noticeably does add more gloss. 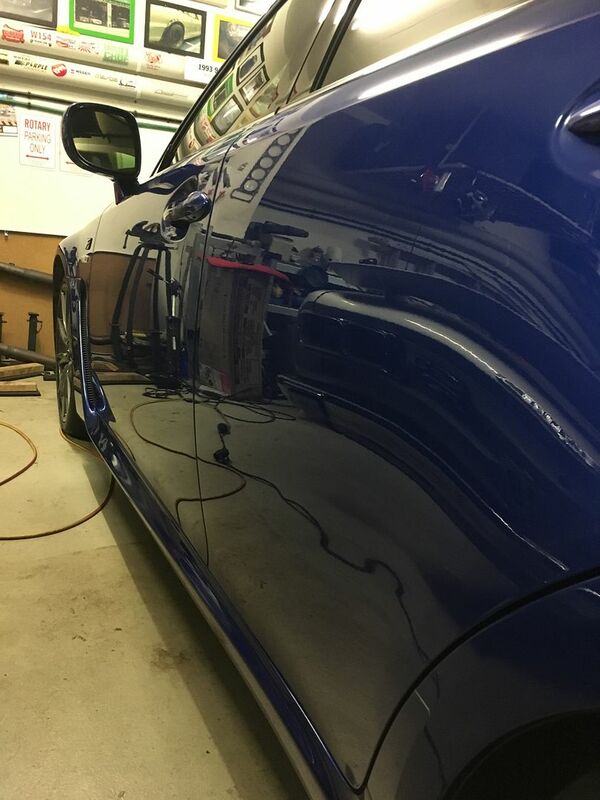 But to get that mile-deep look like the paint is still wet, there is one more polishing step to add that last bit of gloss. 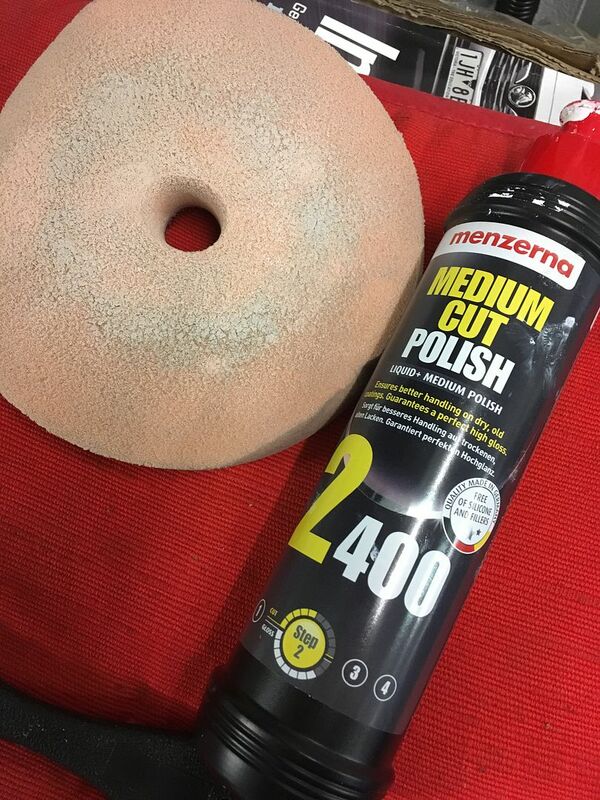 This is the fine cut polish, which is applied with a finishing pad, which had smaller holes in the foam than the one I used for the medium cut, and feels smoother to the touch. Again...same process to apply as described above, and it does seem to have knocked the rougher edges off the paint, and it's now quite reflective. 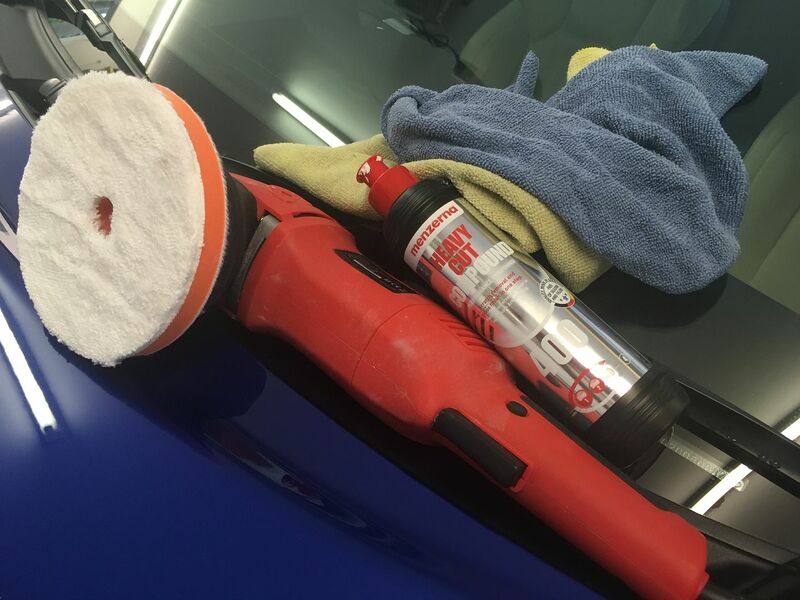 Now that the paint correction is done, we can start to apply the Mohs coating. 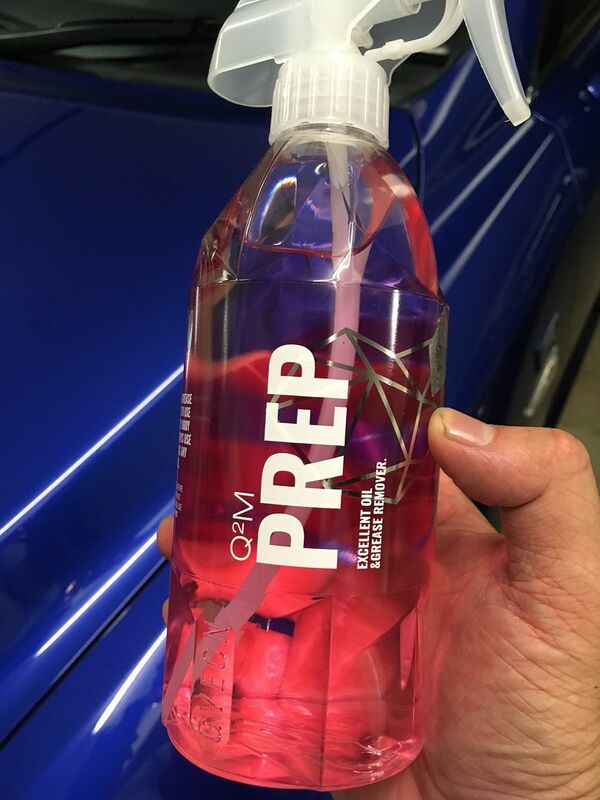 Before we do that, the whole car needs to be sprayed with this stuff. 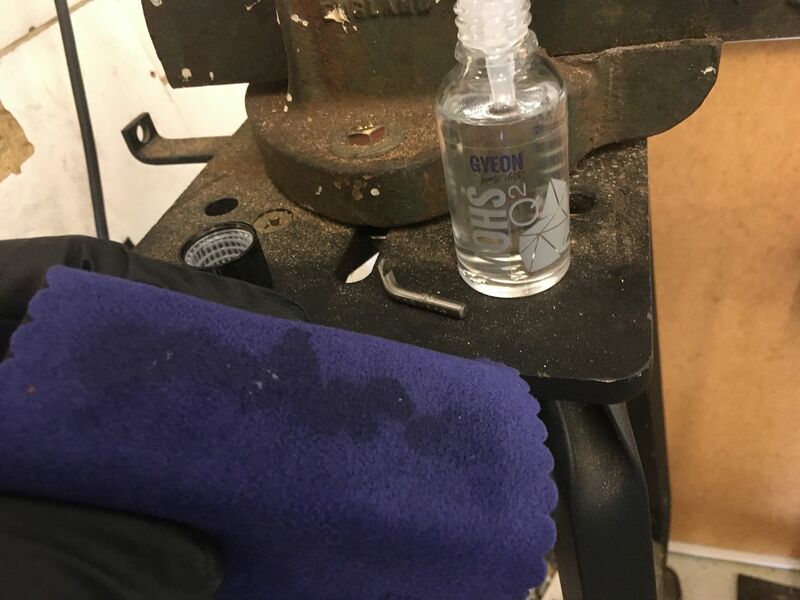 It's like an alcohol, but a bit stronger and it's to remove the oils and lubricants leftover from the polishing stage. 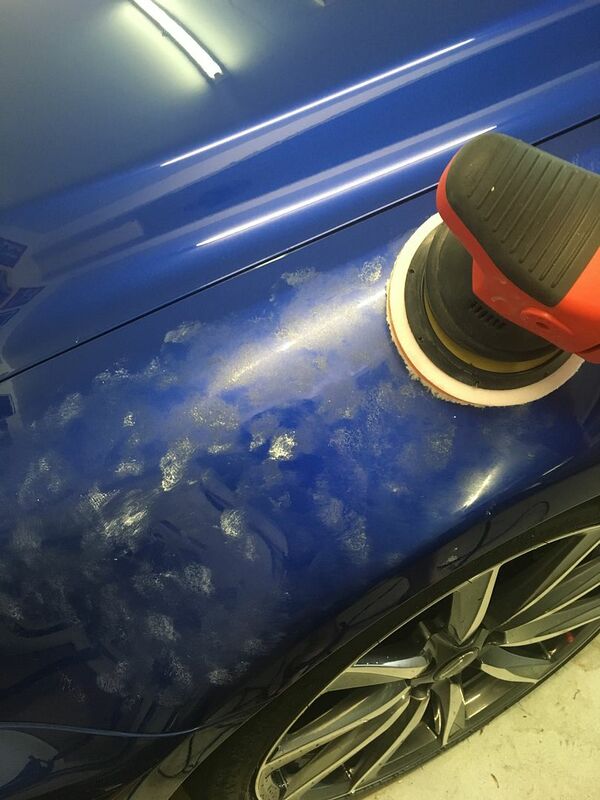 This allows the coating to bond better to the paint. 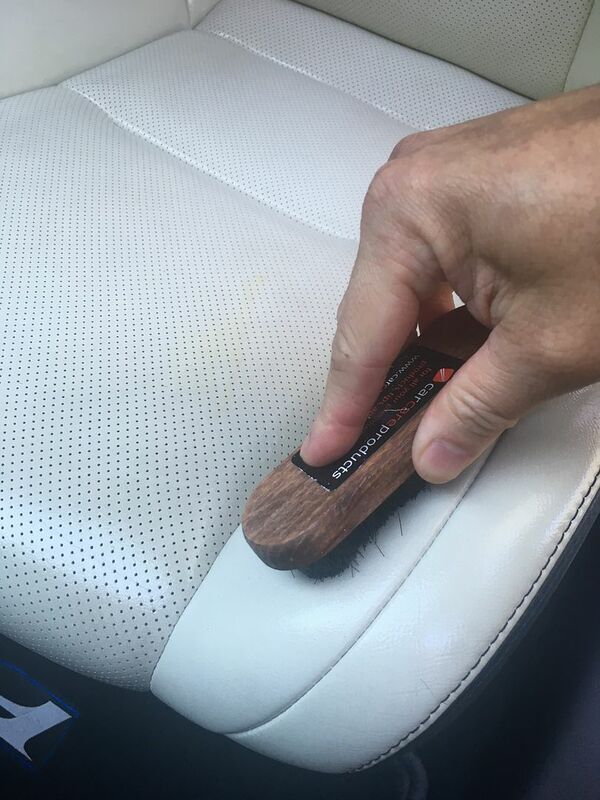 It's applied very generously to the car, and then carefully wiped off. 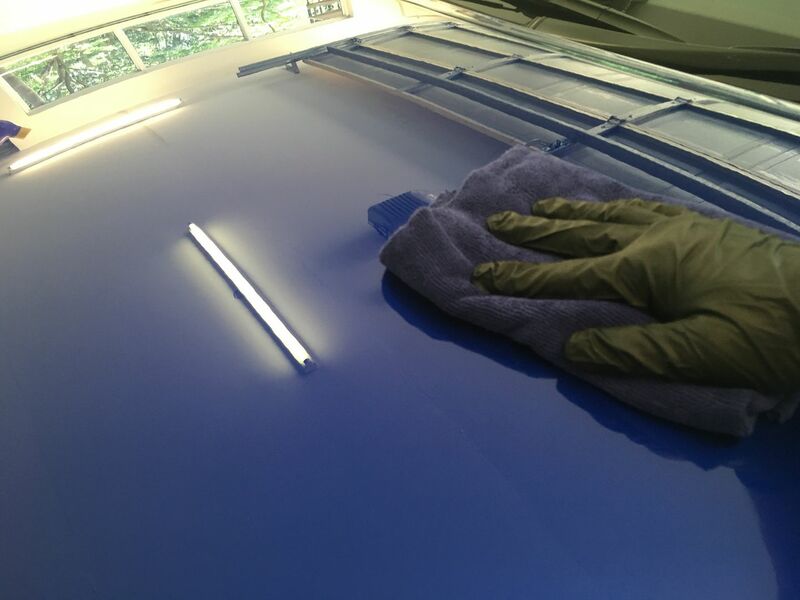 There are no more steps before we apply the coating, so it's important to use a new (or at least freshly washed) cloth to wipe it off, as you can't leave any dirty streaks. Do a very small section at a time, so that it doesn't get a chance to fully evaporate and leave a streak. You start by wrapping one of the cloths around the foam block, and dribbling on about 12 drops of the Mohs solution in a line. It goes on like a greasy film, so it's easy to notice if you missed a spot. Just the same, you do a criss-cross pattern to get it nice and even. 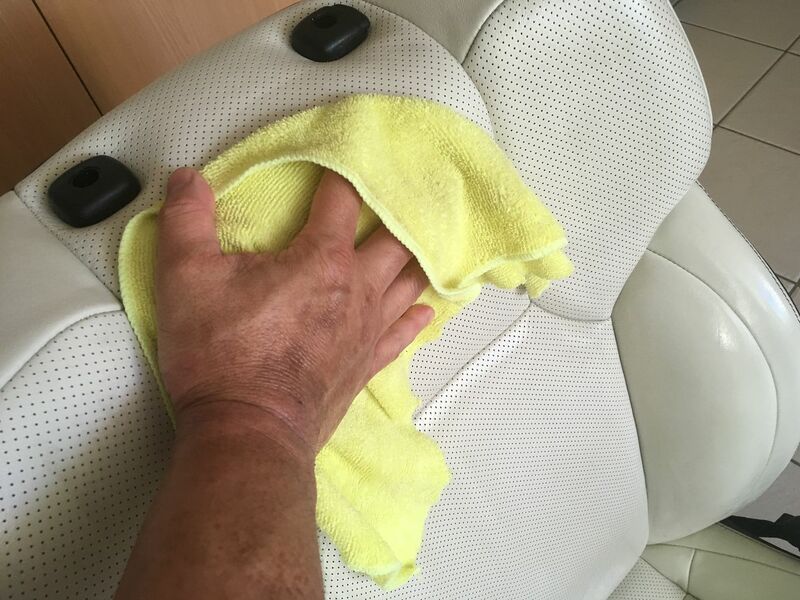 In the summer heat, it flashes off quite quickly, so I do a small patch at a time (eg half a door or 1/6th of the bonnet), wait 15 seconds and then buff to remove. 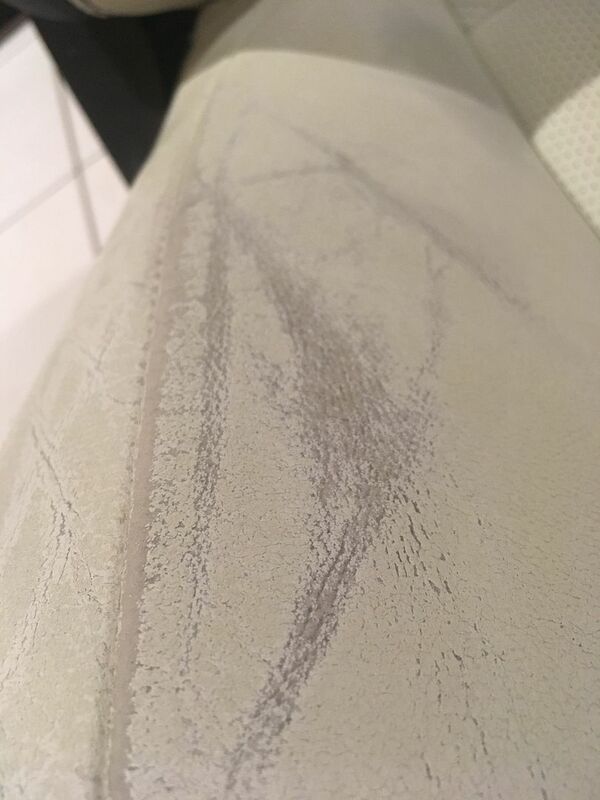 As with the alcohol-wipe stage, it's super important not to leave any streaks so I use a new cloth and keep checking the paint reflection in case I missed a spot. Any streaks will dry that way. Then you have to walk away and let it sit for 12hrs, before applying the Q2 Cure. 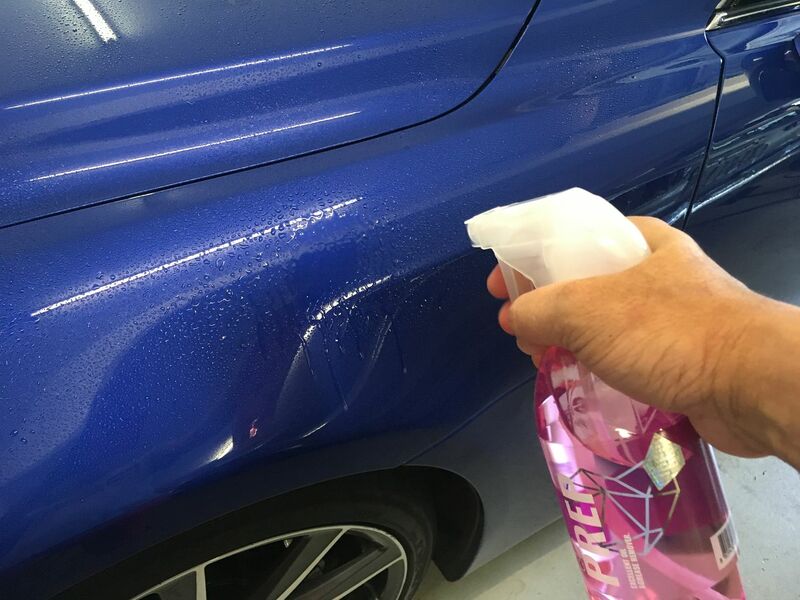 It's like a detailer-spray that's meant to be applied every now and then to give the coating some protection and to top it up. Spray it sparingly on a cloth, and wipe it across all the panels, one small section at a time. 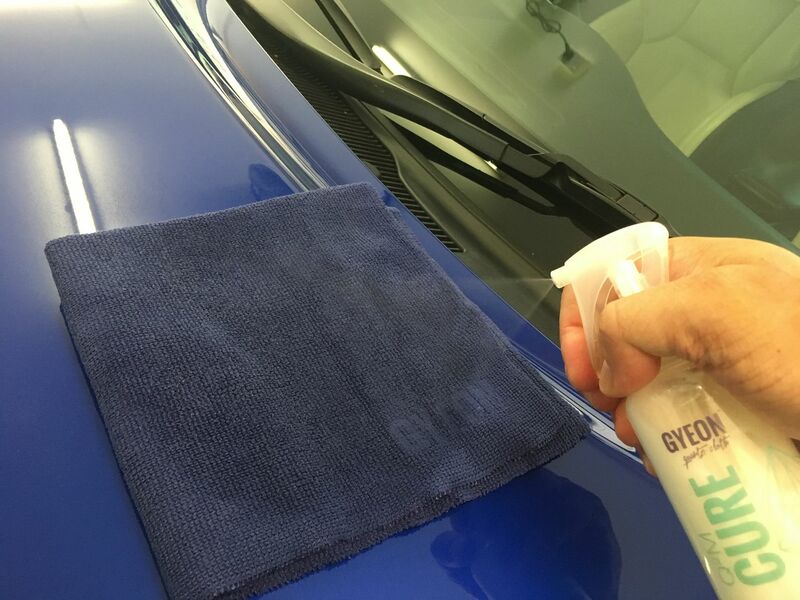 It can leave milky streaks so as before; wiper on and then use a freshly washed cloth to buff and pick it all up. And then you leave it alone for another 12-24hrs before you can move the car, to allow the whole shebang to cure. Apparently it doesn't fully cure for 2-3 weeks, so the instructions warn you not to wash the car for at least a week. So I think keeping the car dry is probably not a bad idea. 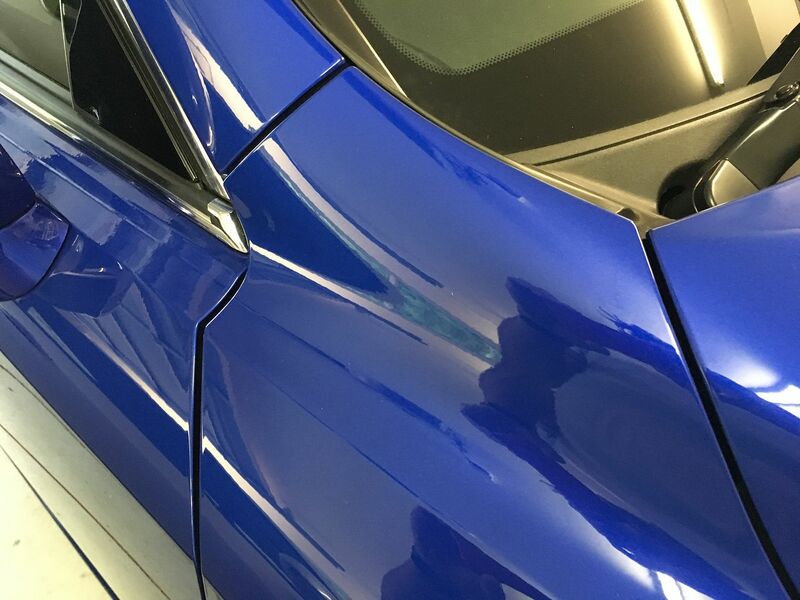 The coating is meant to be a hard sealant to protect the paint correction work done underneath, but it also adds a fair bit of reflectiveness. It's meant to last 12mths and is hydrophobic, so rather oddly driving in the rain seems to make the car cleaner. 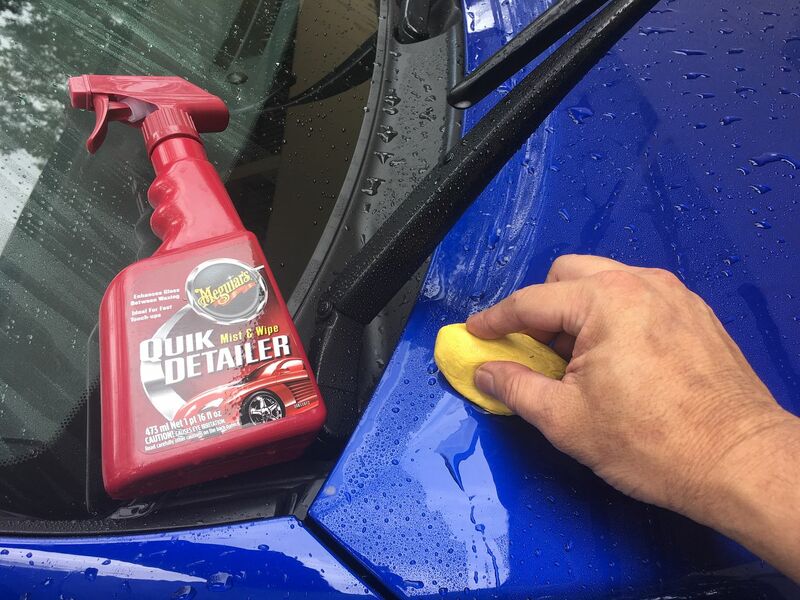 Its water-repellant properties also seem to make dirt less likely to stick, and it's a lot easier to wash and keep clean. 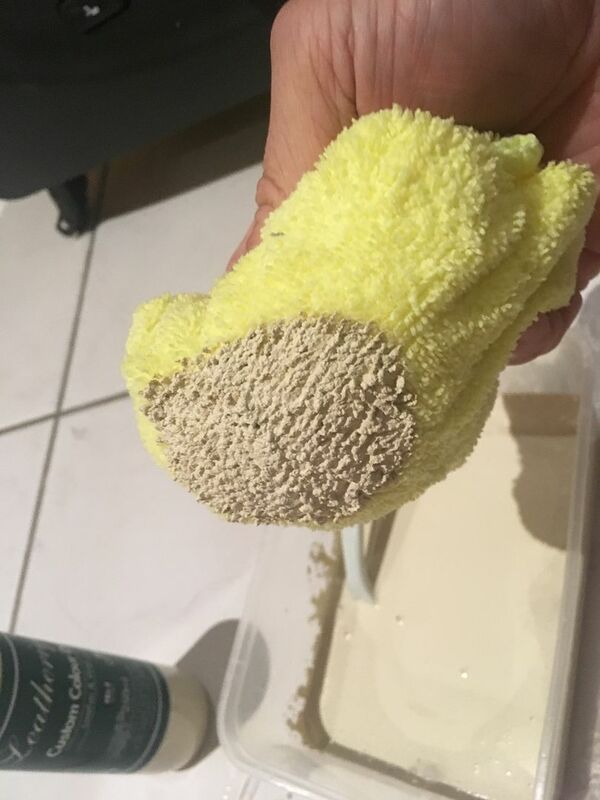 I ran a water hose over one of the suede cloths I used to apply the coating, and yeah it seems water repellant; you can run a hose over it, and the water all runs off and the cloth comes out dry. 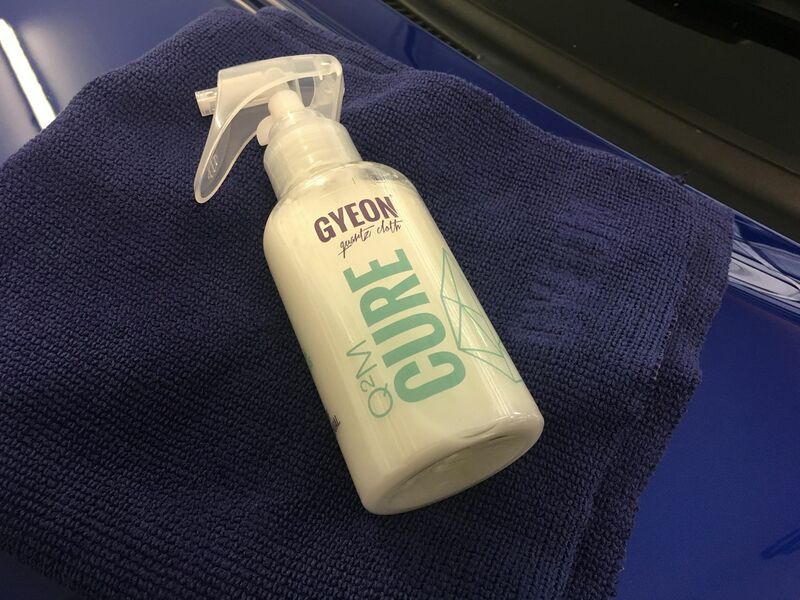 It's been 2 weeks since the Gyeon Mohs paint coating was applied, so it should have bonded to the paint and be safe to wash the car now. And you can see the water-repelling properties. It does also mean that dirt is less likely to stick, and everything just glides off when you wash the car. 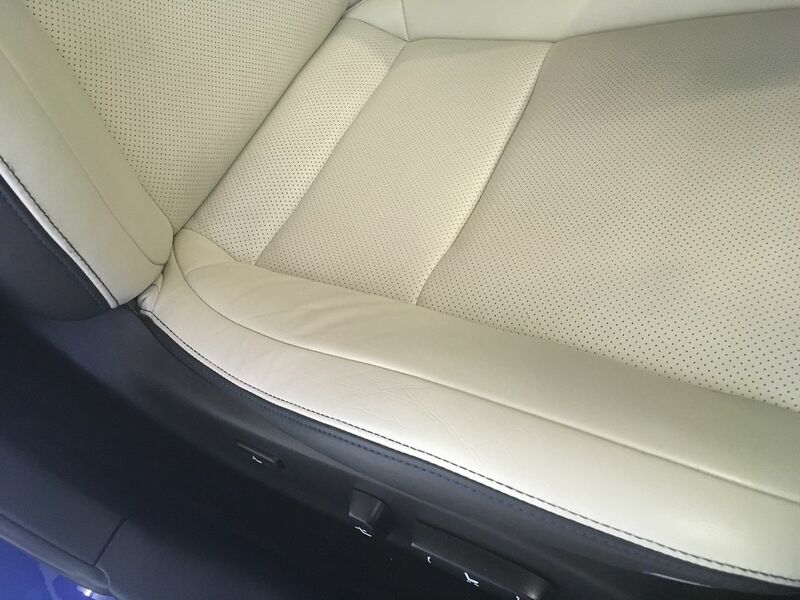 But another detailing episode which was less successful, were the seats. 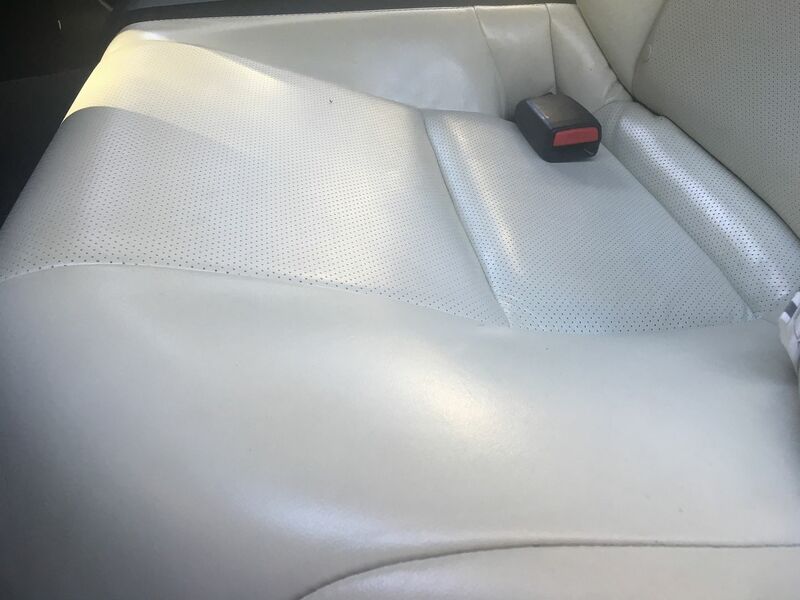 They were in good shape when I obtained the car, but I think I might have scrubbed the leather a little too enthusiastically when cleaning, plus a year's worth of wear and tear meant that there was a spot on the lower cushion where the colour had rubbed off. 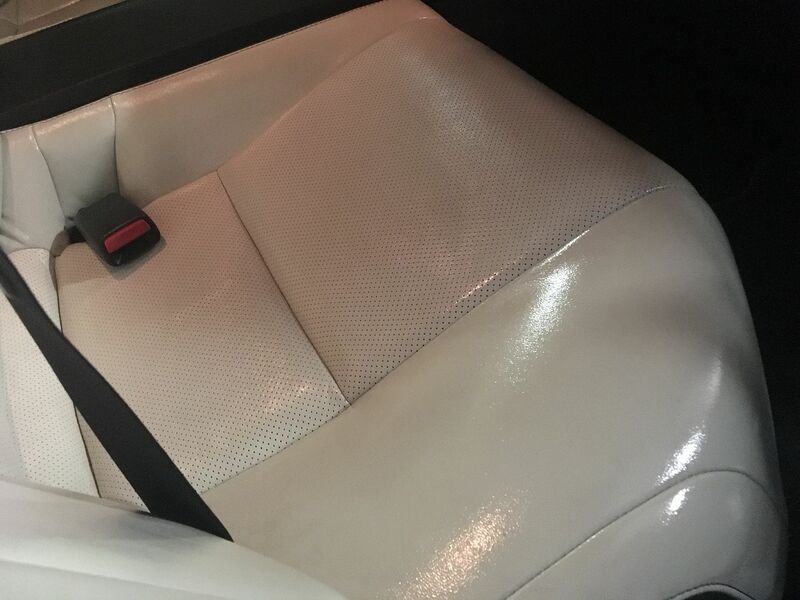 The dark-coloured leather beneath was now showing, and it's super-obvious given that the rest of the seat is a lovely sparkly white. 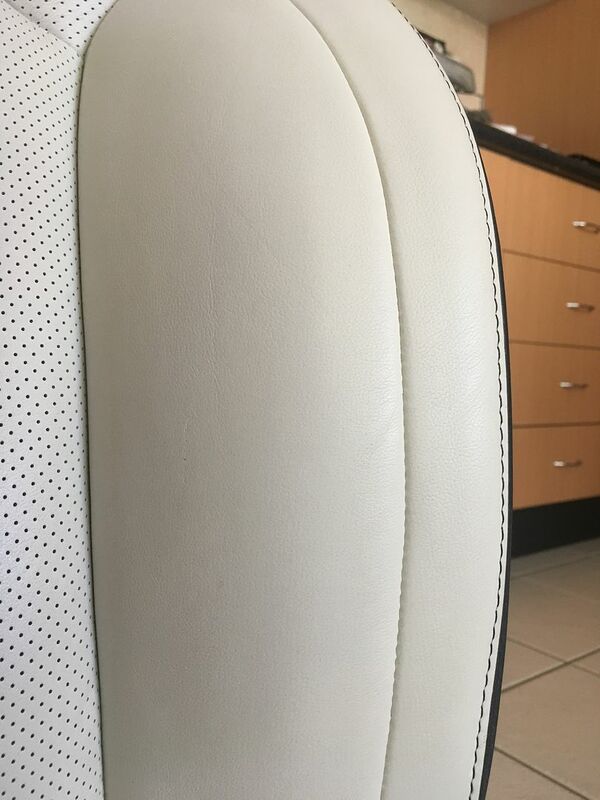 The wear is exacerbated by the seat foam not being as plump as it used to be: this means that the leather folds and creases when you sit on it, which wears out the colour in the high spots. 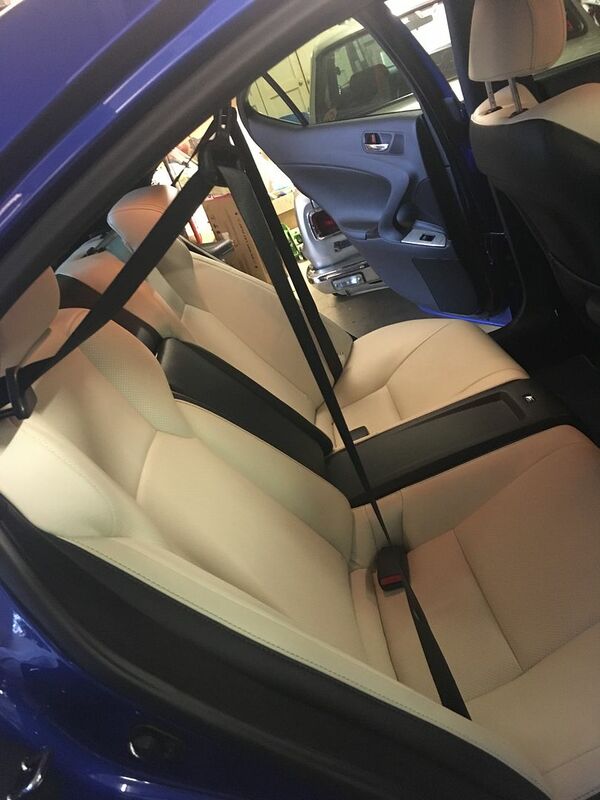 This is in contrast to the passenger seat, where the leather seems to be pulled a lot more tautly. 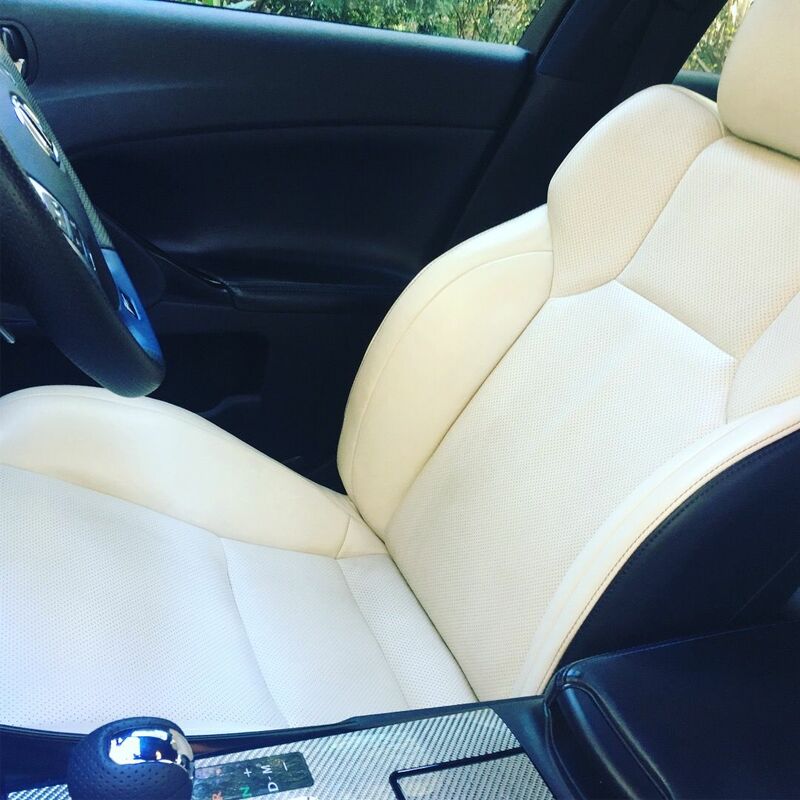 Of course, white leather doesn't come from white cows, and automotive leather is hot-rolled with a polyurethane paint to give it colour and an even grain. 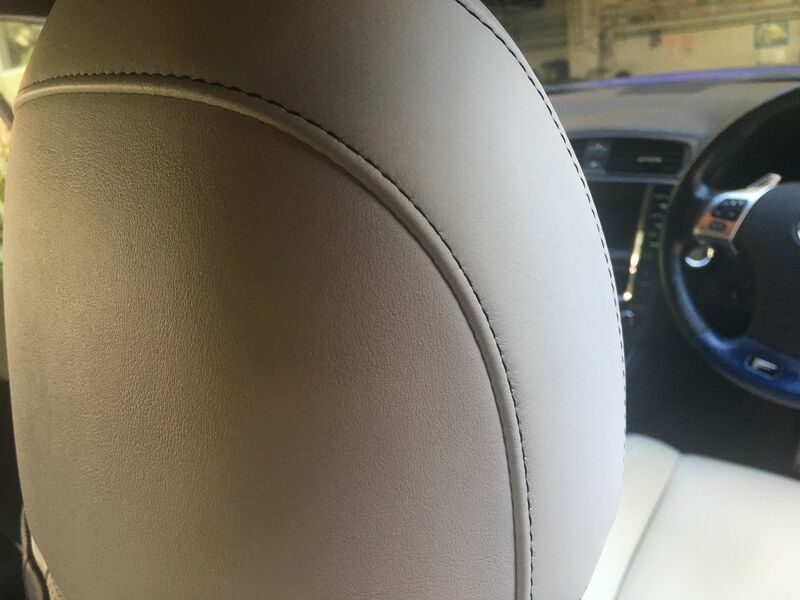 So it's all totally artificial but very uniform...however it means that when the surface wears, it's like a paint layer rubbing off, which doesn't have the distinguished aged-leather appearance that old cars might have. 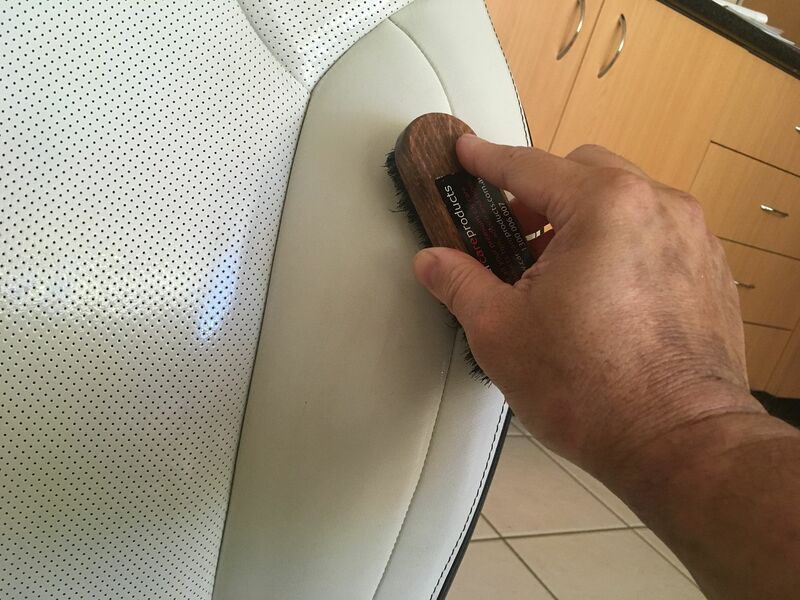 My trimmer suggested this guy: https://newliferepairs.com.au/techni...-greg-helmore/ He sands back the leather in the spot that needs to be repaired, then has this three-step dye process where he mixes up the colour to match and sprays it onto the seat. And it came out...rather well. We'll see how durable this new colour is, but initial impressions are that he did a great job. The close-up pic makes the repaired section look more creamy and offwhite, but I think that's just the result of different lighting when I took the pic. Overall the colour match is spot on. 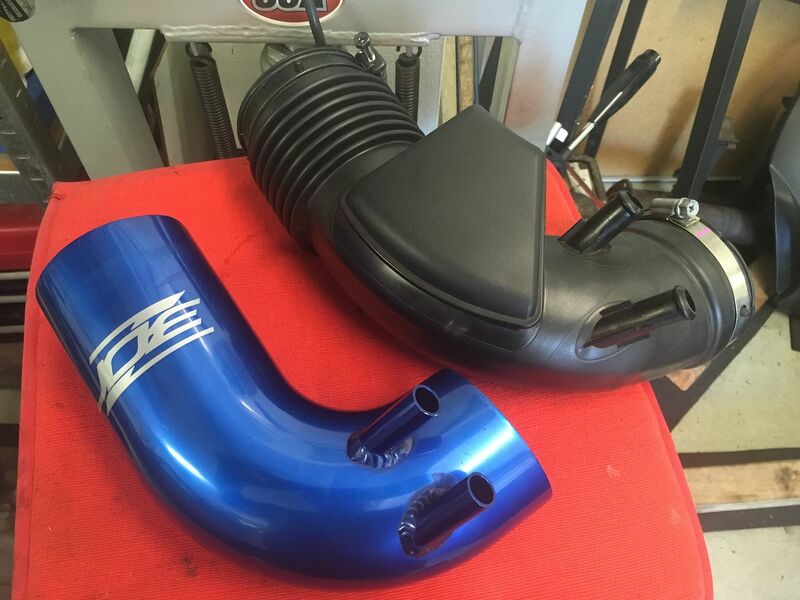 It's a JoeZ intake elbow, that replaces the stock plastic one. Now, I don't think that there's anything terribly wrong with the stock plastic piece; the JoeZ item is slightly larger in internal diameter, and would flow a tiny bit better because it doesn't have the concertina-bit like the stock one. 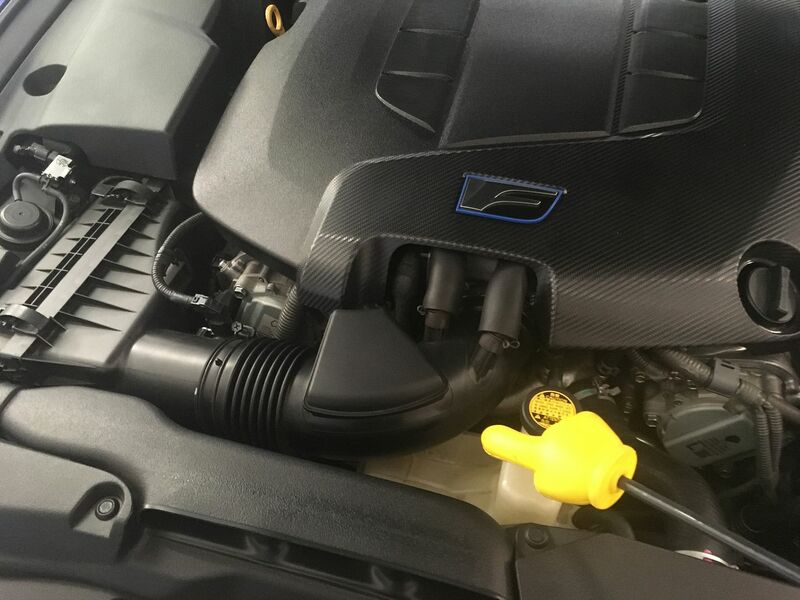 Apart from that, there are no other changes and the stock airbox and filter element is untouched. 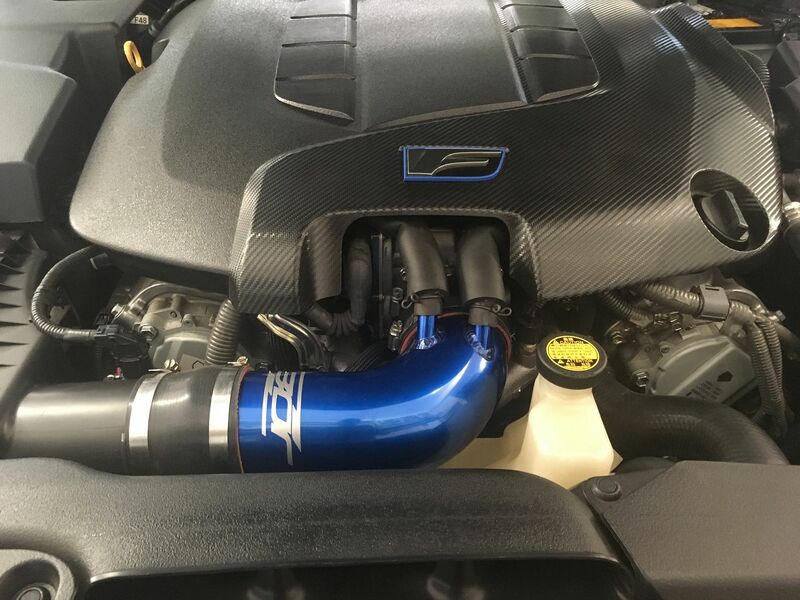 It's claimed that the new pipe adds 4.6rwhp, which is dangerously close to a seat-of-the-pants rounding error, but the main benefit I was after was a louder sound. When stock, an ISF has a really lovely induction snarl when it goes past 4000rpm, but it's all calibrated to the usual tomb-like quietness of the cabin when stock. The moment you add a noisemaker mod like an exhaust, the induction bark gets drowned out. 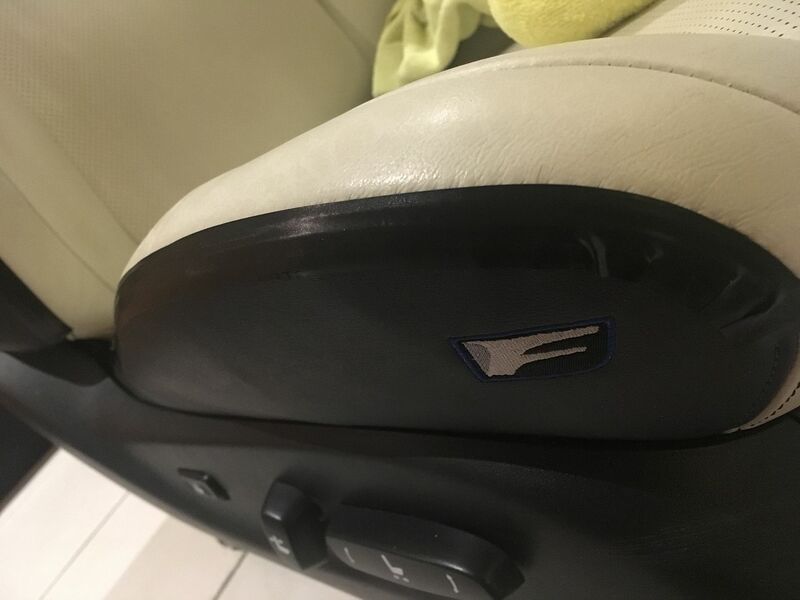 So it's said on the Lexus forums that the JoeZ pipe restores some of the induction noise to offset a louder exhaust, and I'm all for that. And...yes I suppose it does make the intake noise louder. As for that 4.6hp...I think that anything I might be able to feel, is probably the placebo effect of having just installed a shiny new mod, and/or is the result of the car sounding a bit more dramatic above 4000rpm. But, it wasn't expensive, and took all of 5mins to install, so it's all good. The latest addition to the ISF are some new shoes. 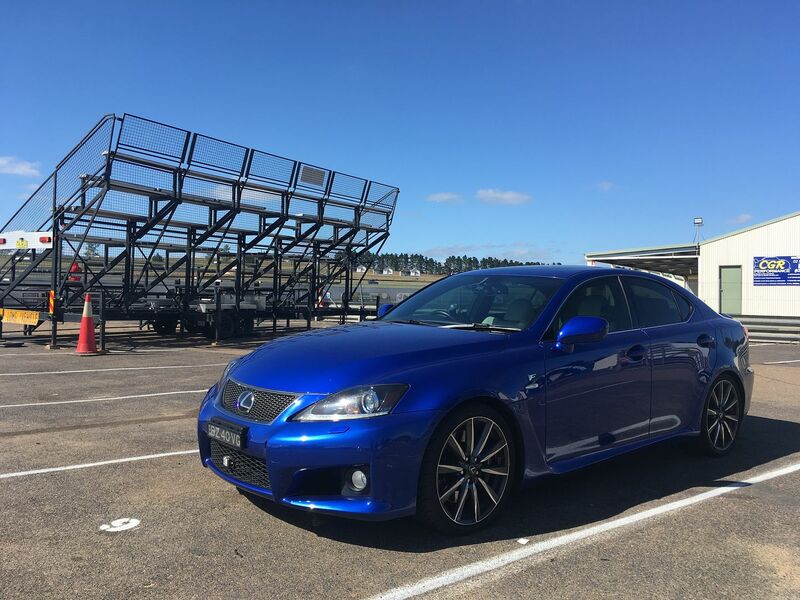 With an upcoming drive day with the Lexus F owners club, and a trackday, the old Michelin Pilot Super Sports didn't look like they'd survive too many laps of the track, so I decided to get a set of my favourite tyres; Advan Neova AD08R. 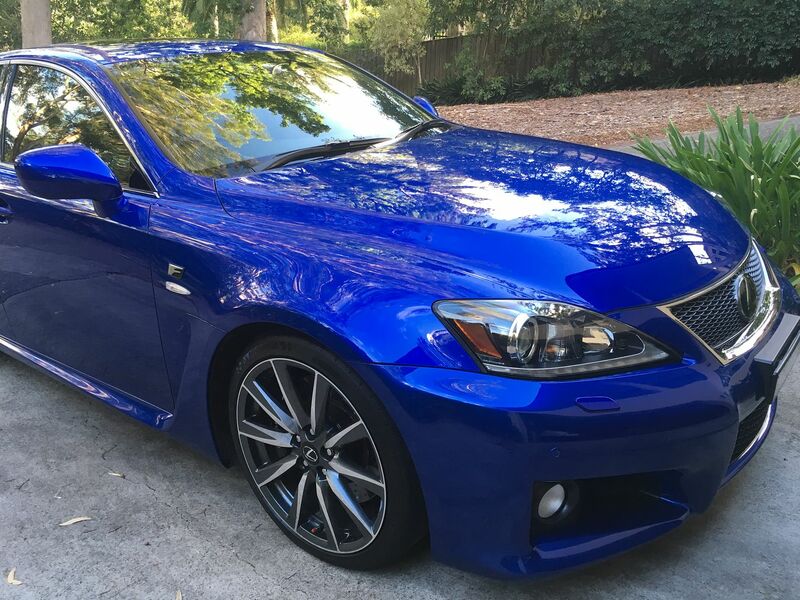 The stock size is 225/40-19 and 255/35-19 which is strangely undertyred for what was Lexus' headline performance vehicle at the time. My wife's bone stock IS250 comes with 225/255 tyres as well, and the tyre footprint is somewhat less than what was available on the M3 and C63 of the same vintage. Even the later RCF and GSF came with bigger rubber at 255/275. 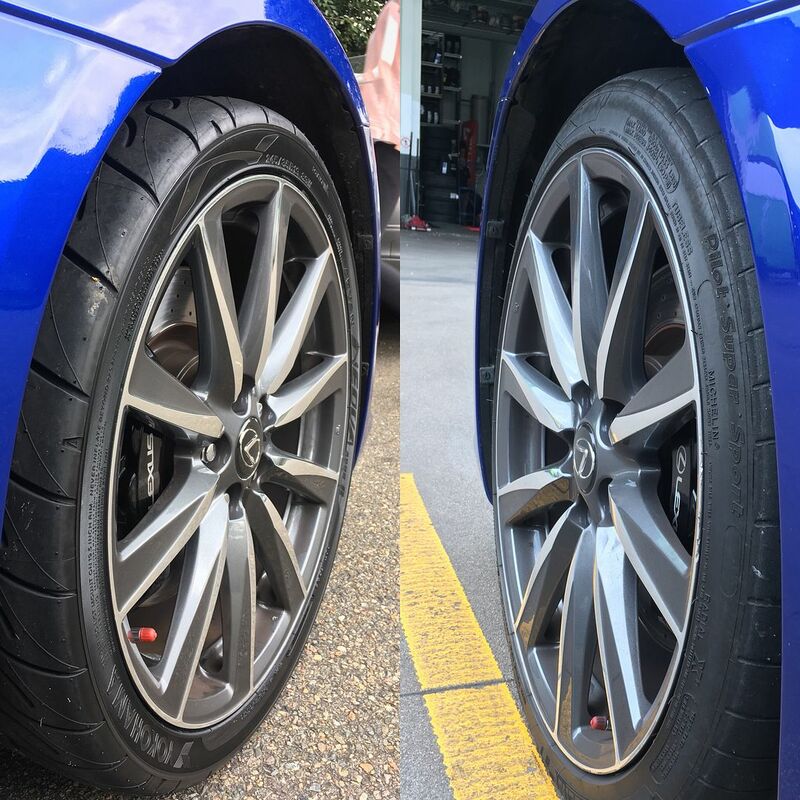 The stock 8in and 9in wheels can take wider rubber, so I decided to go for the common upgrade to 245/35 and 275/30, which bulge out the sidewalls noticeably compared to the stock tyres which have more of a stretched sidewall look. And how does it feel? It does seem to have more grip compared to the (2014-datecoded) old Michelins, and there is definitely more traction with the wider rear hoops, it's no longer breaking traction on a 1-2 upshift. 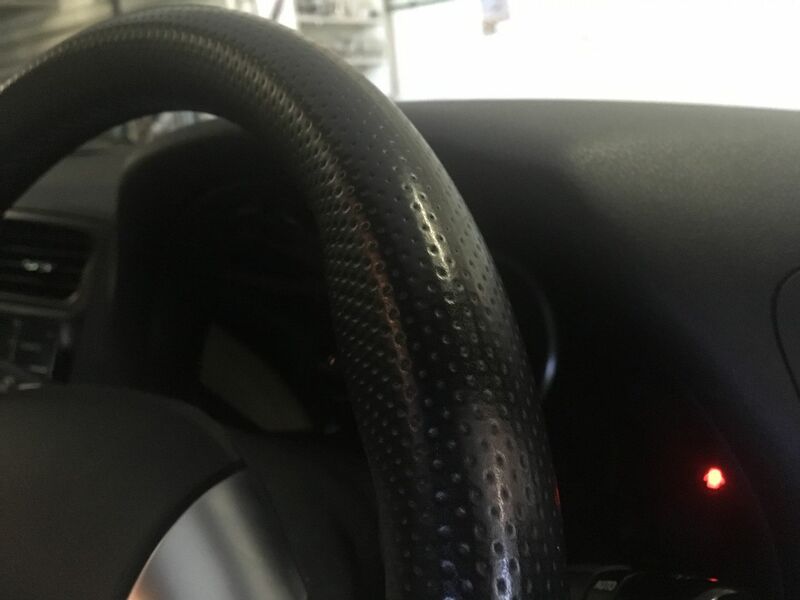 But also noticeable is a change in the steering feel, which seems to have lost a little of the old alertness on the first 1/8th turn of the wheel. I guess it's the softer sidewalls of the new tyres, compared to the stretched-taut sidewalls of the old tyres. And it does seem to ride a bit softer too, notwithstanding that the Advans have very stiff sidewalls for motorsport use. And today we headed to the track! Apart from the new tyres, since the last trackday the brake pads have been upgraded to Endless MX72 Plus. 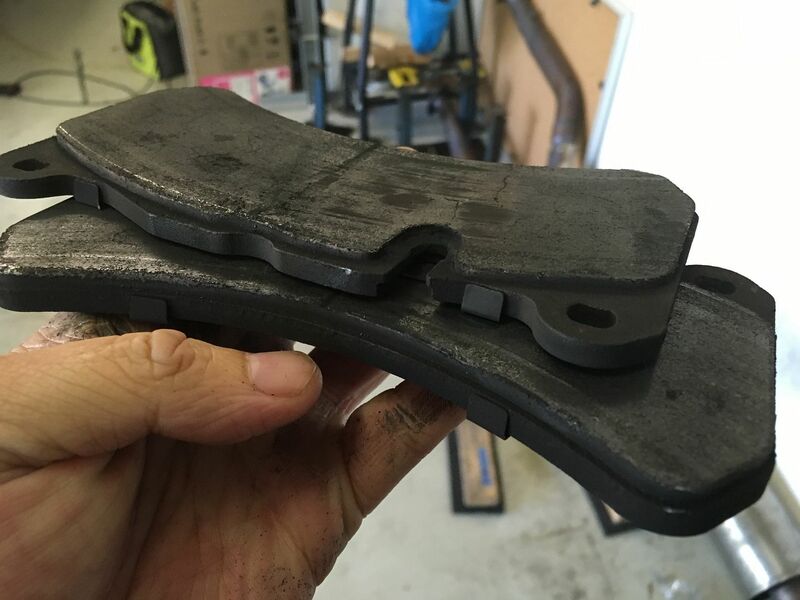 At the last trackday I'd fitted a brand new set of Brembo pads, but they wore to almost nothing before the end of the day. I'd used these before in my old RX-7 and they were a good road/track compromise, with little noise and dust. 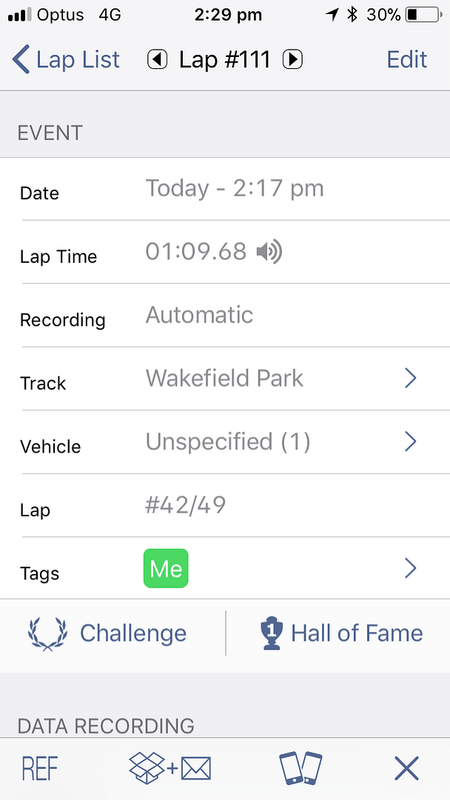 At the last trackday, I'd found that I was a half second quicker with the traction control set to Sport. 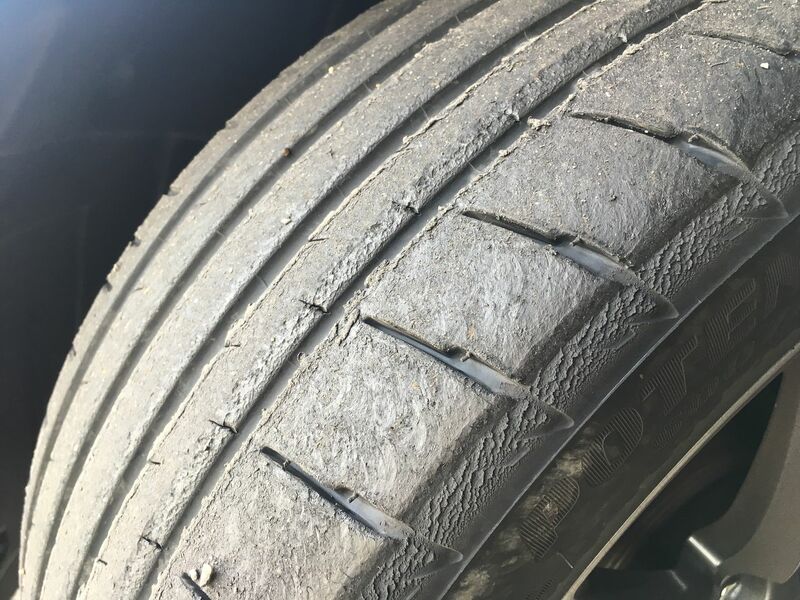 The Michelins weren't very consistent and it was too easy to overheat them with just a slide or two, so keeping the traction on seemed to keep the car straighter and there was just the right amount of power being doled out, allowing little powerslides without overwhelming the rubber. So I started the day the same way, with traction on in Sport, and the new Advans were definitely much more consistent. The old Michelins felt like they had a narrow sweet spot before they overheated, so you had to pick your battles with the traffic on the track, as to when you were going to go for a good lap. 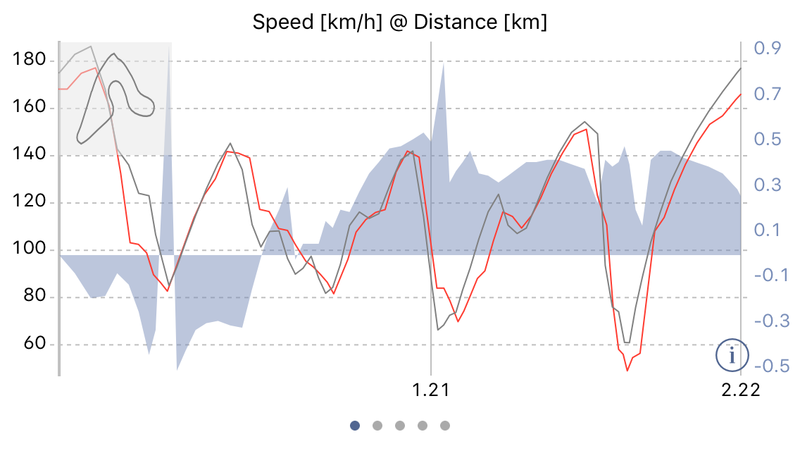 In comparison, the new tyres seem to be at their peak for lap after lap, and so it wasn't long before we'd done a slew of laps that were slightly under the previous best time of 1'10.21. But a couple of tenths better was all she'd do. It did feel different this time 'round...the traction control didn't seem as intune with the tyres as it was before, and instead of gentle power-on slides, it now felt like the traction control was pulling the plug a little abruptly and costing us precious time accelerating out of corners. I suppose it's possible that the grippier new tyres might unload the inside tyres more, causing the traction control to come on more aggressively. So I decided to try a session with all driving aids off, and surprisingly it was much better. On the Michelins, it would transition to power oversteer a little messily, but on the Advans it's much, much more predictable; it was easy to hold a slight powerslide on the throttle and driving a little sideways doesn't feel like it's costing time. Straight away, the laptimes dipped below 1'10, we did a bunch of laps at 1'09.7-9 and eventually the day's best was 1'09.68. And here's the in-car of the best lap. There's still a little fine tuning I'd like to do...the car feels a little nose heavy, and notwithstanding the wider front rubber, is a little reluctant to rotate on corner entry. It's very stable on entry, so it's hard to mess up a lap by backing into the turn too much, but a little more front end bite on the way in would be nice. On the flipside, the balance on the power after the apex is just fine and dandy, so I'm a bit loathe to want to change tyre sizes. As for the brakes, the new Endless MX72 Plus held up their end of the bargain and together with the Advans, you could do 5 or 6 laps within a tenth of your best before the car started to lose consistency. Where before, you had to save the brakes and tyres for a nice gap in the traffic and then go for it for one big lap; now the ISF seems to be able to stay at its peak for much longer. 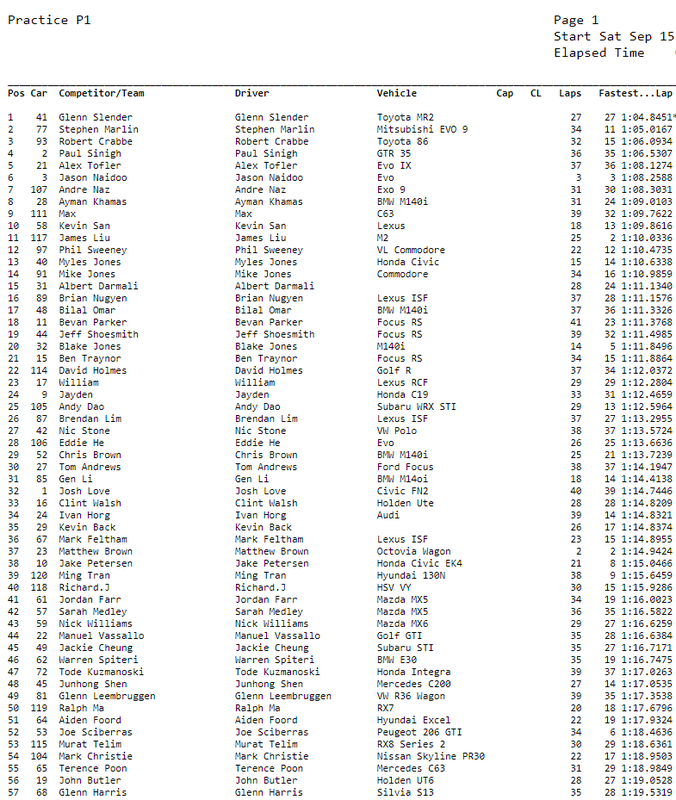 Overall, the ISF is a little quicker than my old FD RX-7, which was a few tenths behind at 1'09.94. Needless to say the FD is far more nimble and gets its laptime from finesse rather than brute force. But the ISF has got heaps of brute force, so it's a little quicker, but a tiny bit less entry understeer would make it more entertaining. 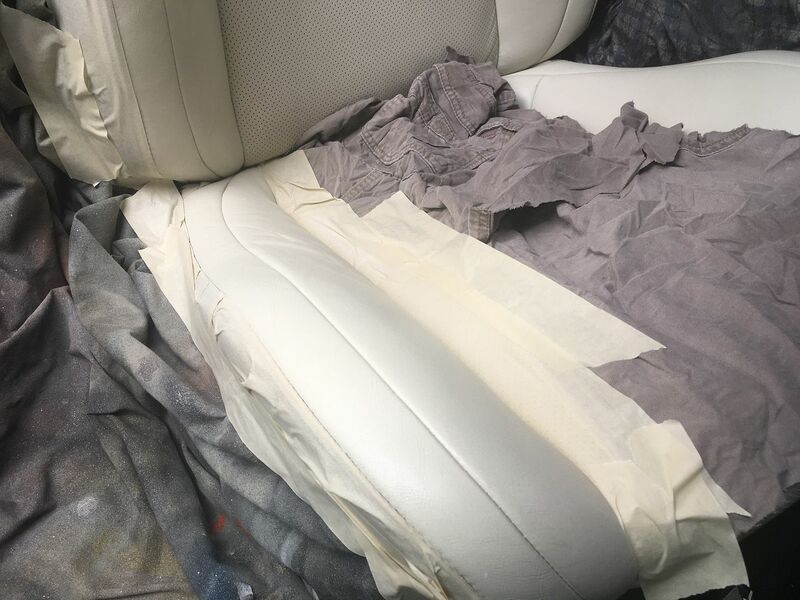 Late last year I decided to have the side bolsters of the driver's seat repaired. 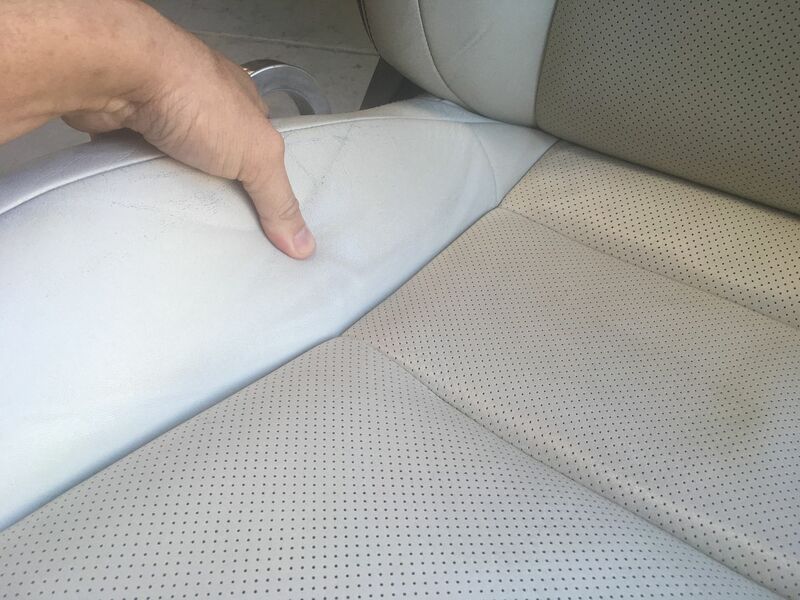 Due to the big bolsters on the seats, pretty much all ISFs have unusually high wear on the edges of the seats. 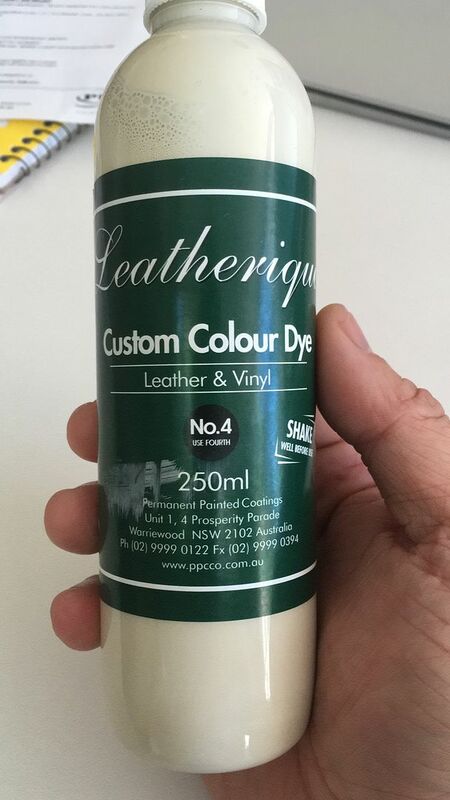 A dude came to my house, sanded the leather and applied a new coat of paint which looked great for a while. But it didn't last. 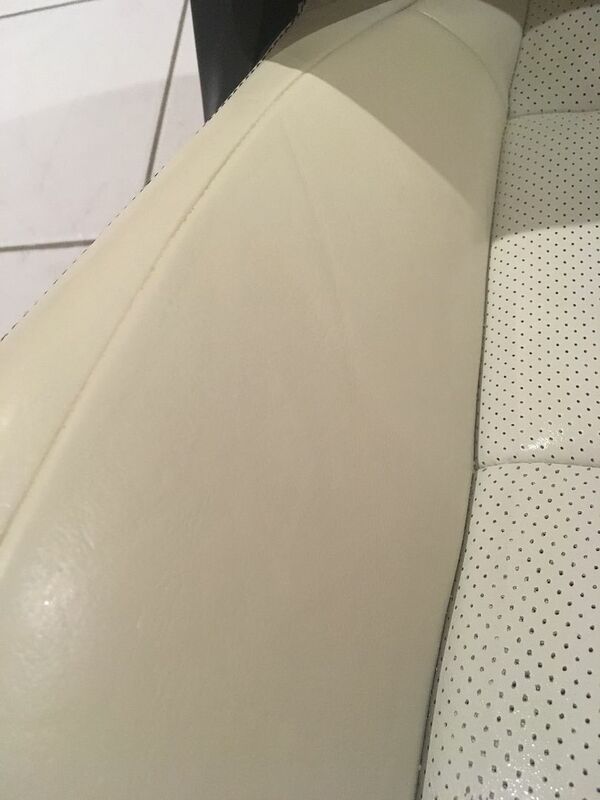 Basically the foam under the leather was collapsed, and everytime you sat on the seat, the leather would crease and fold. 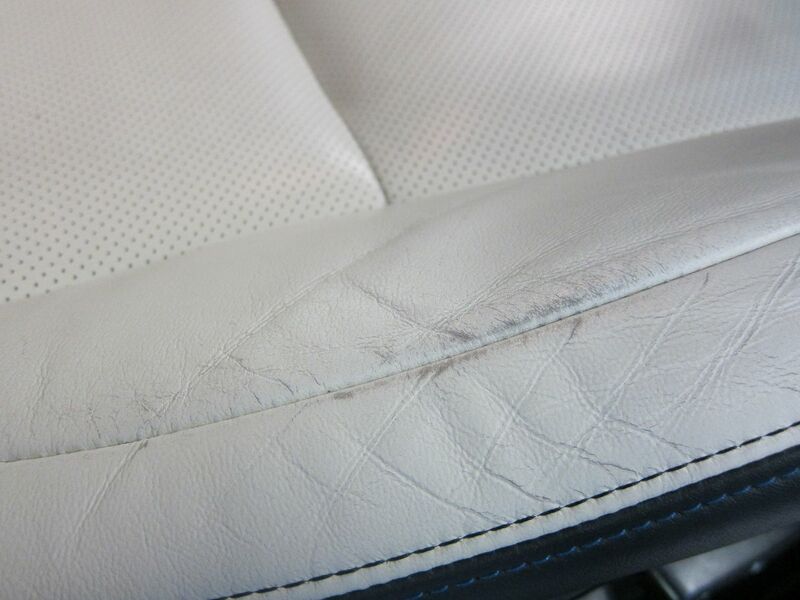 This flexes the leather and cracks the newly applied paint, which in my case started flaking off within a month. 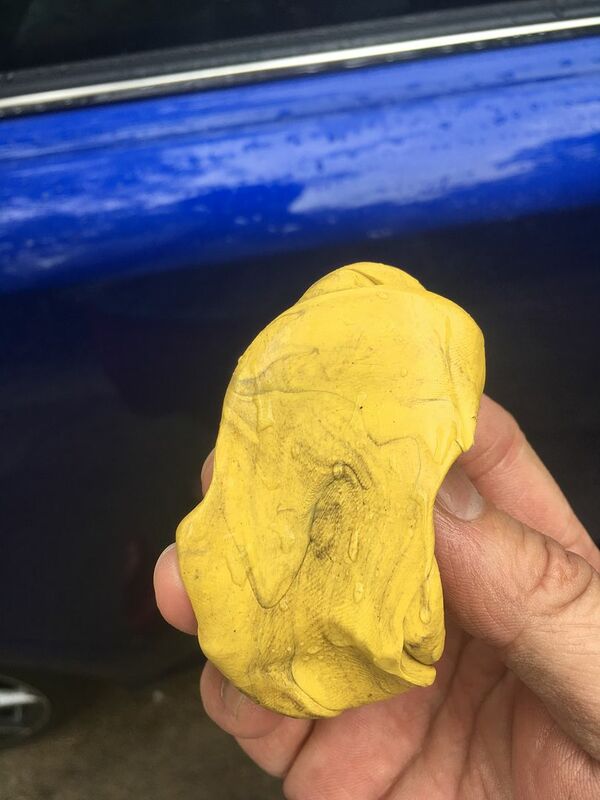 It's not the fault of the paint guy, in fact he did caution me that unless the foam was repaired, the repair possibly might not last very long. 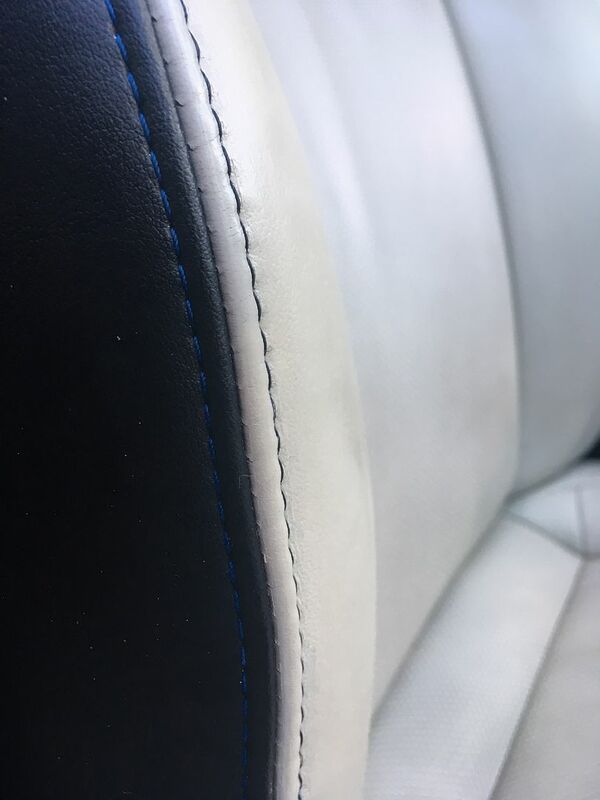 And so you see today, the leather is saggy and where it's creased and folded, you can see the darker leather underneath the surface. 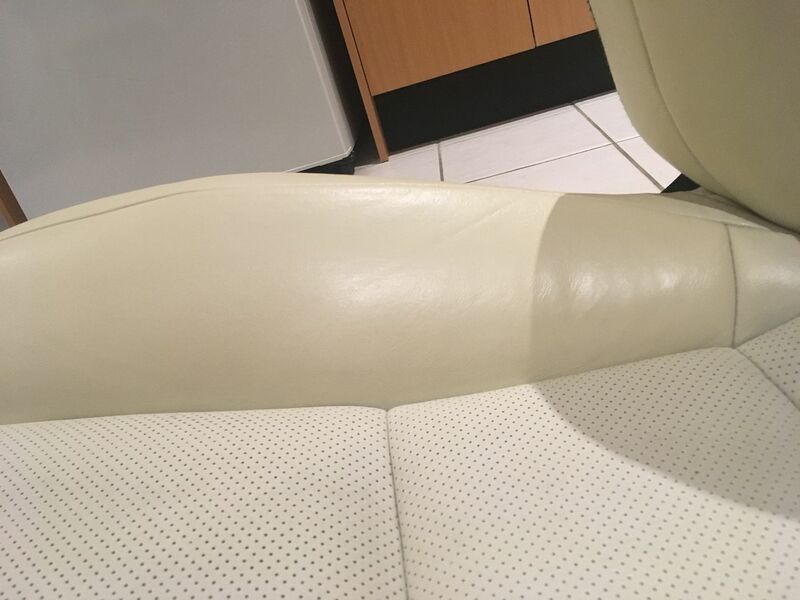 In comparison, the leather on the tunnel-side of the seat is nice and taut and you can't make it bunch up like the outside bolster, no matter how hard you try. So the foam has to be repaired before we try anything else. So I took the seat out of the car and dropped it off at my favourite trimmer. $250 and a couple of days later, the outside bolster was a mirror image of the inside one again. The creases and folds are now pulled tauter, which kinda makes them more obvious now But you'll also notice that the leather is still a little wavy, and isn't perfectly flat and smooth as it should be. More of this anon. Now before we get too carried away with what happens next, we should talk about leather. 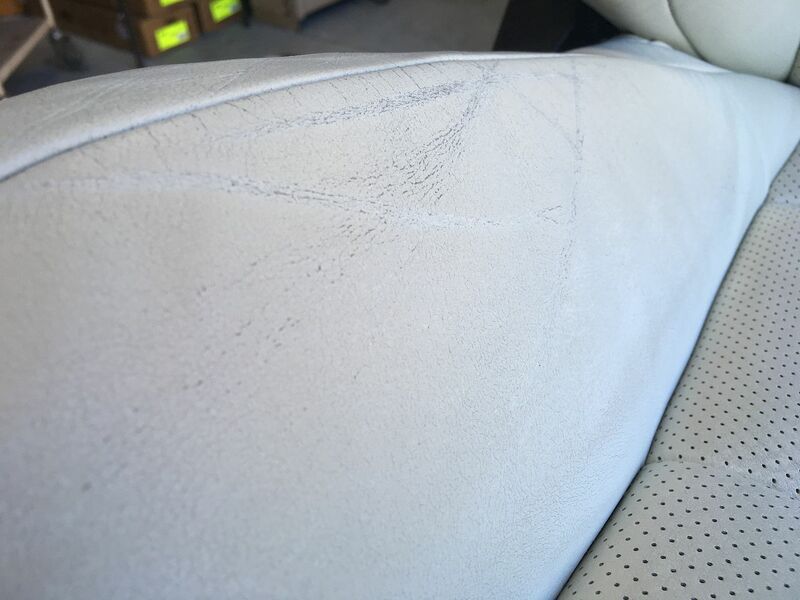 The grain that you see on leather seats isn't natural at all, but is in fact a pattern that is hot-rolled into the leather with a polyurethane coating. 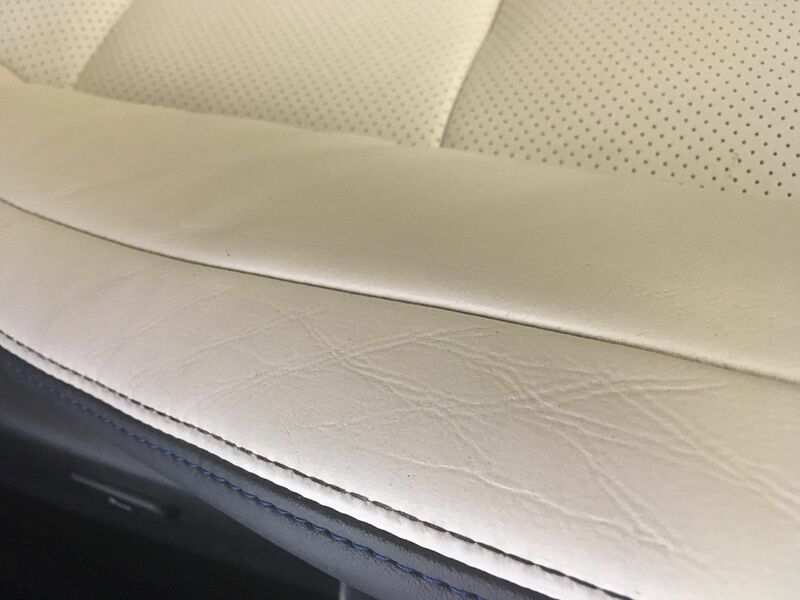 That's why leather seats are such a perfectly uniform grain. When leather comes off the cow, it peeled into 5 layers. the top and bottom layers are used for handbags, book binding and shoes, and it's the middle layer that gets used for seating. It has no grain, which is why an artificial grain has to be imparted on it. So it gets rolled to install a plastic outer layer, which is both the colour and the grain. 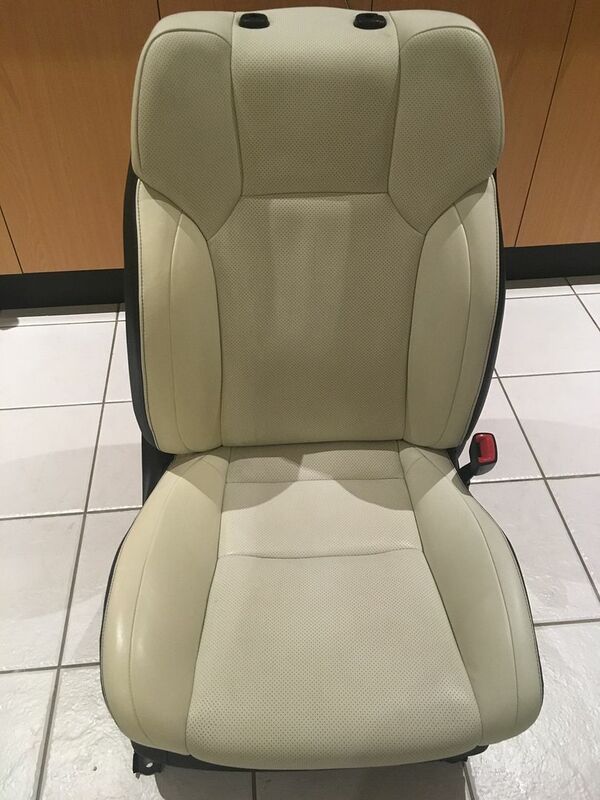 And when modern seats age, rather than look mellow like a vintage piece of furniture, the colour layer peels or flakes off and the seats look terrible. So the repair that we're about to apply is called a "dye" but it might be fairer to call it a flexible coloured coating. 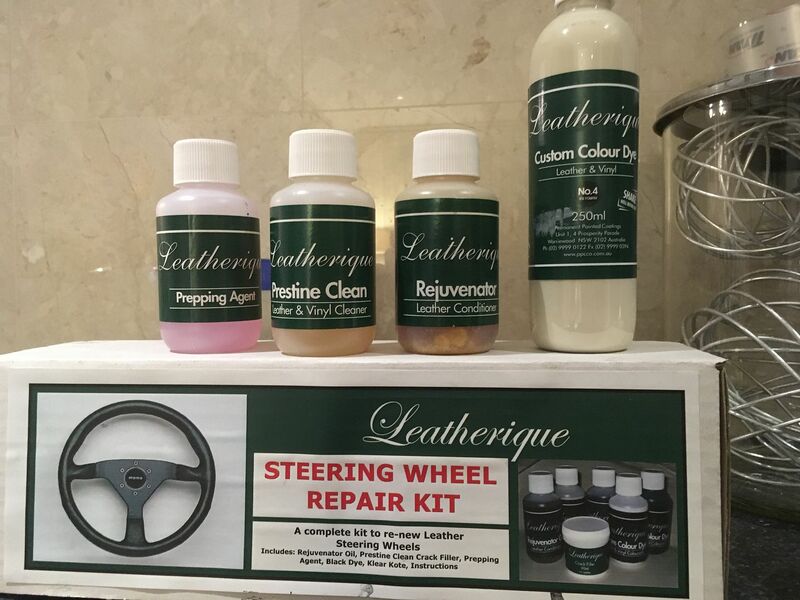 Years ago I had to restore a leather steering wheel, and so I bought this Leatherique kit which worked pretty well. 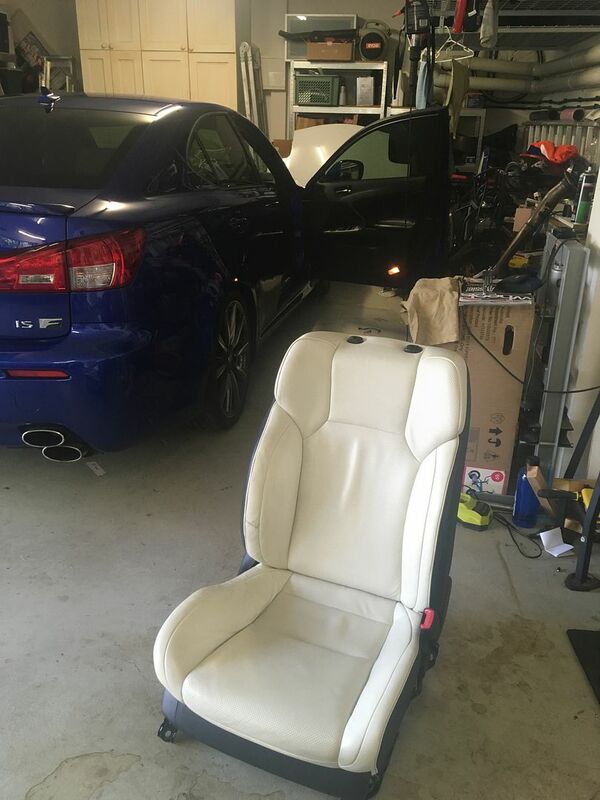 There was enough left in the kit, that all I had to get was the colour, which was mixed up at http://www.ppcco.com.au/ to suit the seat. There's multiple steps, and as you'll see the whole process takes about a week. The first step is to apply the Rejuvenator, which is like a moisturising oil. It's not oil and is actually water-based, but it goes on like a sticky, honeylike oil. 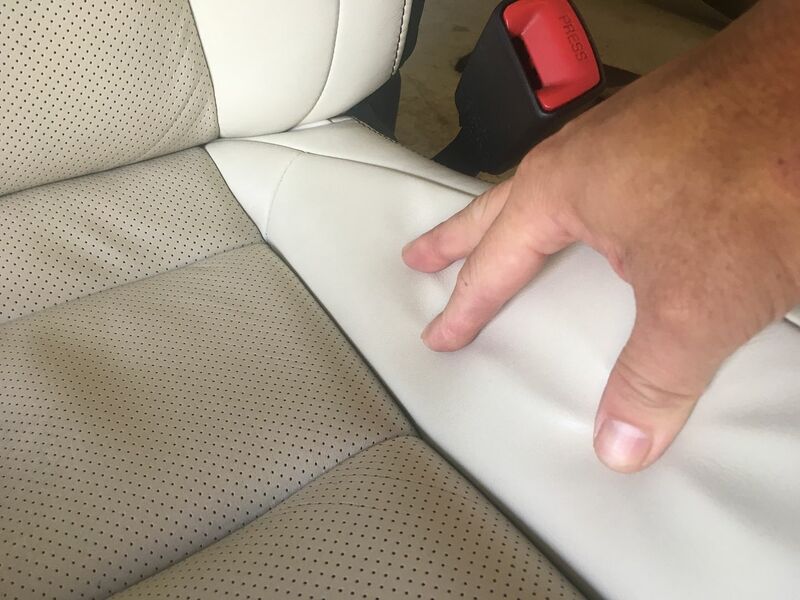 The idea is that it seeps into the leather to soften it...now if you've been paying attention, then you might be thinking that it can't possibly soak in, because the leather has that hotrolled plastic coating, right? And you'd be correct! 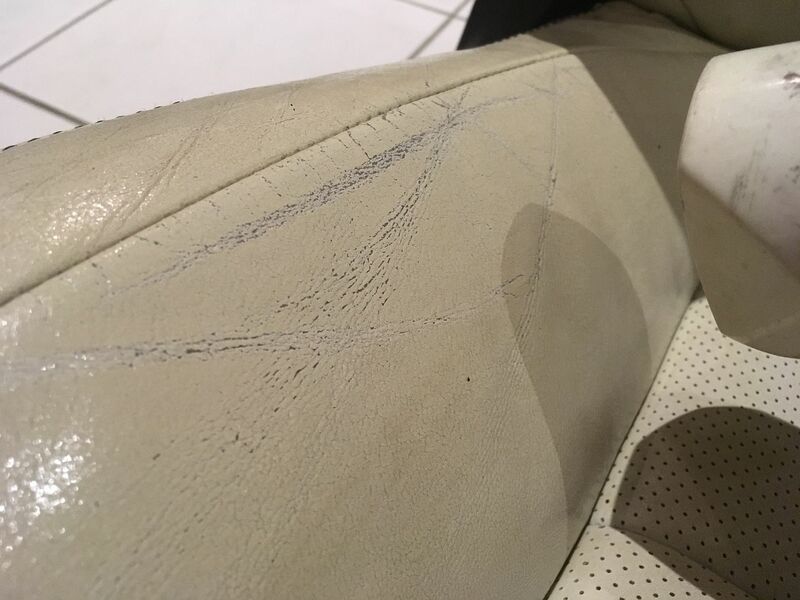 The next morning, the areas where the leather is good, still show a thin sticky layer of the stuff...but the areas where the leather coating was damaged and the base leather was exposed...on those areas the sticky goo had been totally absorbed. 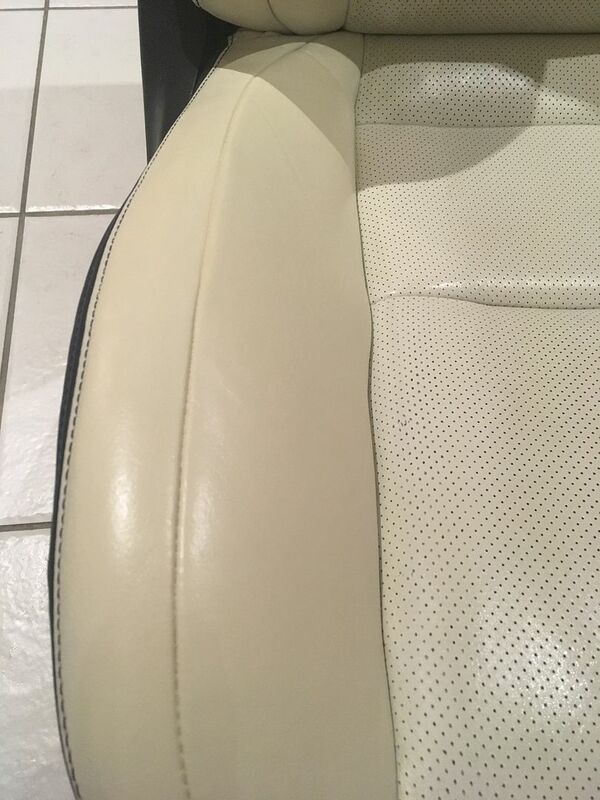 I think this is important, because leather dries out once the coating is breached. So this is the last chance to get some moisture and flexibility back into the damaged sections. 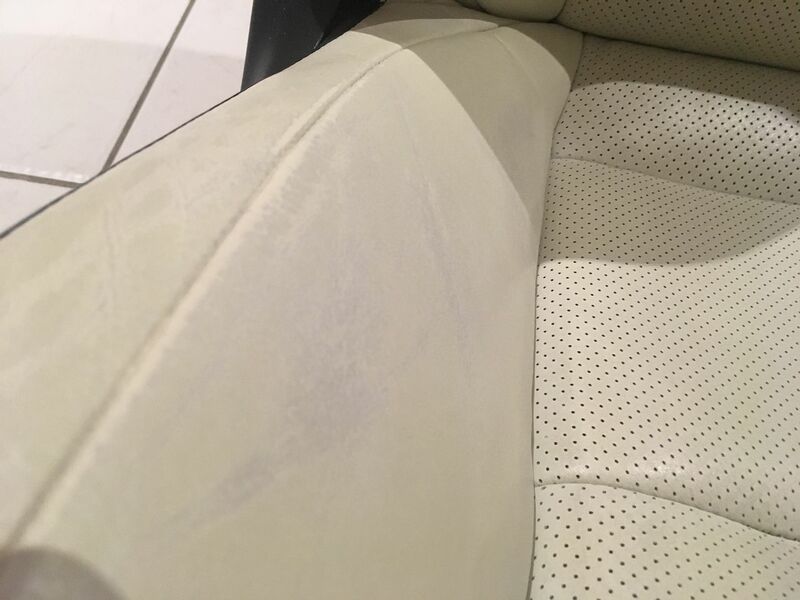 Also, there is still some absorbtion in the "good" areas of the seat, because there are always pinholes and micro-tears in the coating which let the stuff through. And the large sections which are perforated absorbed the stuff the best. 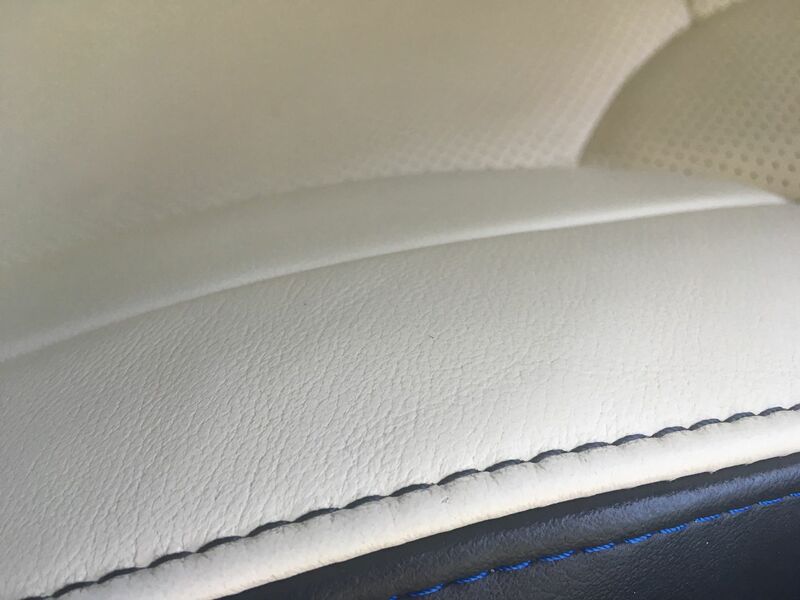 Remember how the leather still looked a little wavy after the repadding? 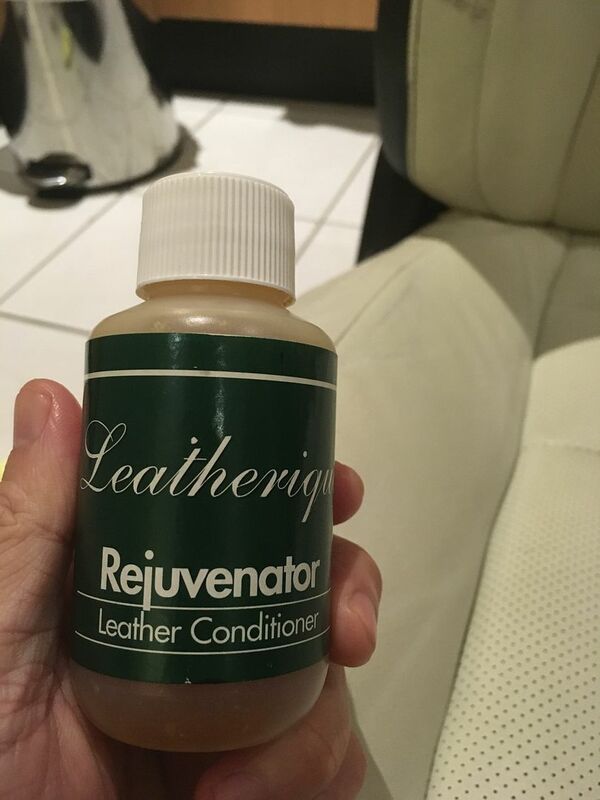 Well, the Rejuvenator seems to have fattened up the leather in the creases and made the whole thing more supple, so straight away you notice that it's flatter and more relaxed-looking. 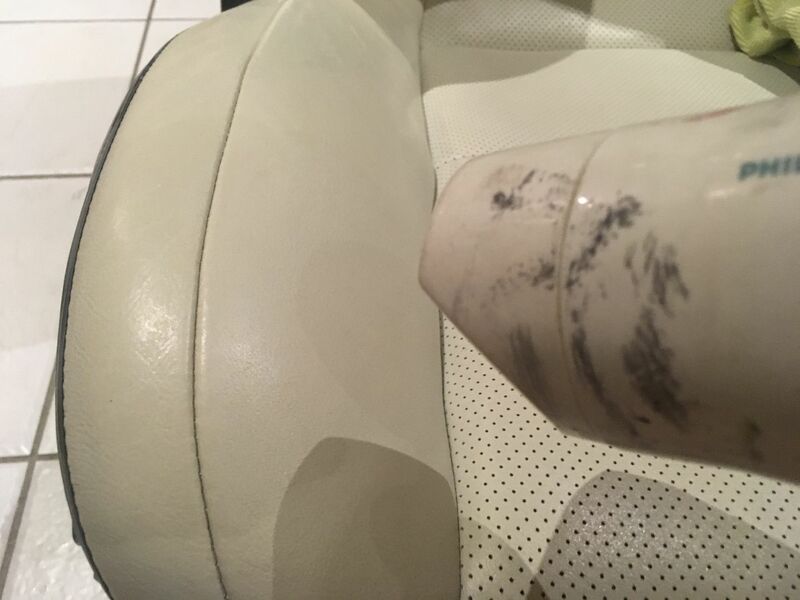 Rejuvenator and Prestine Clean are what Leatherique recommends to clean and condition leather as part of your normal maintenance, so I did the whole seat, which now felt noticeably clean and softer. You then have to wait 48hrs before progressing to the business end. Which involves sandpaper. 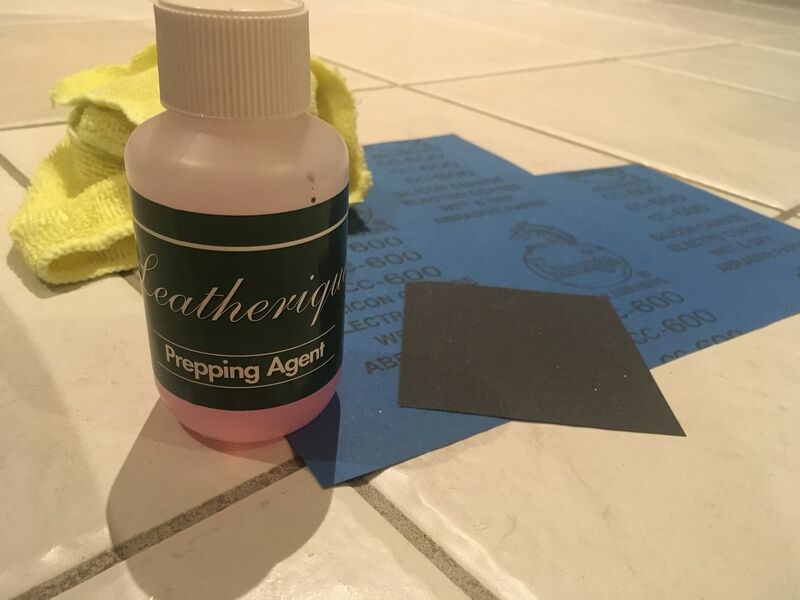 You fill a bowl with the Prepping Agent, dip some 600 emery paper into it, and go to town to remove the old damaged dye and leave a smooth surface. 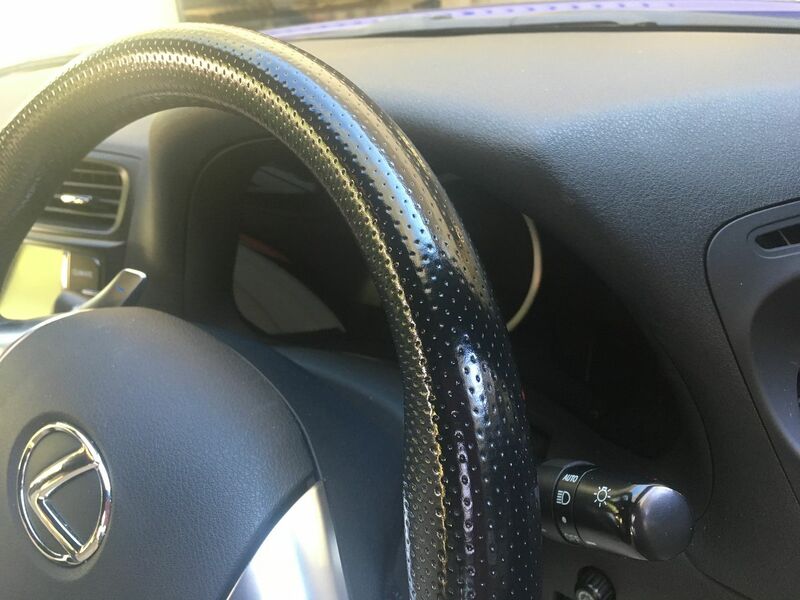 After all that, wipe down to see that you have well and truly passed the point of no return Run your fingers across the leather to see if what you feel is a totally smooth, even drag. If you can feel it on your finger tips, you'll see it under the new dye. 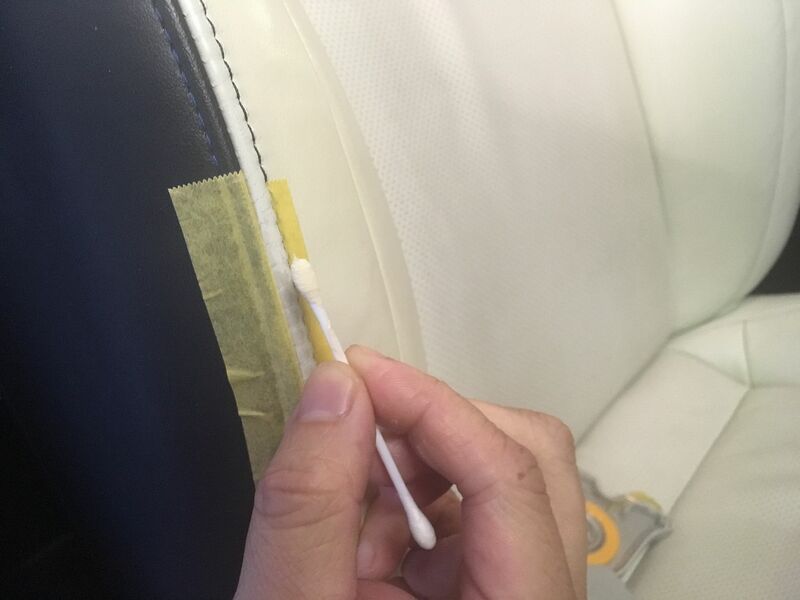 In this pic below, you can actually see on the left, that the paint repair was actually slightly browner than the seat colour. Then you mask the black stitching with electrician's tape, which I figured was more flexible to accommodate the bumpy stitching. Shake the crap out of the bottle of dye, pour it into a container and stir it again...then get a clean cloth, rinse it and wring it dry, then form a "puff" with it that has no edges. 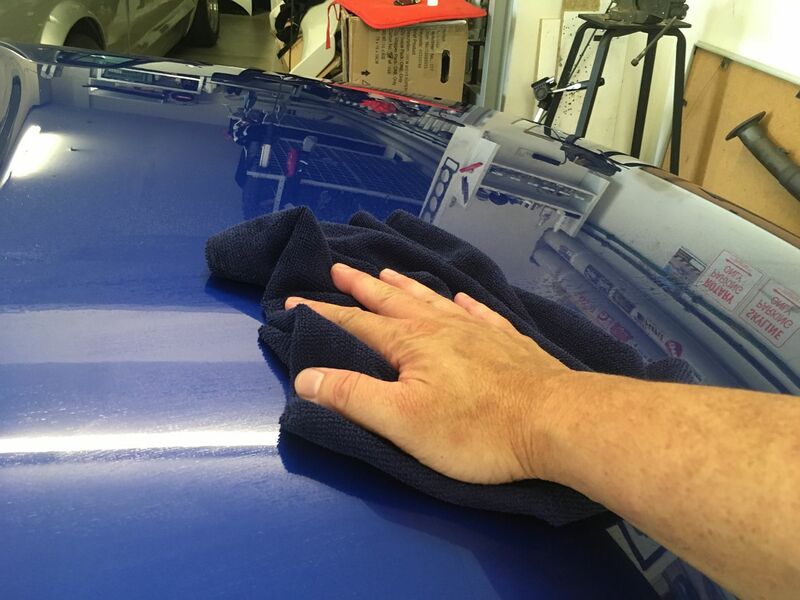 Then rub on the dye with light, circular strokes, like polishing a car. I start off with light, thin coats, which dry in 10mins with a hairdryer. After a couple of coats...you can still see the dark patches where the old colour came off. But after about 6 light coats, it's looking pretty good. The finish is an even semi-matte, and you can't see any strokes or splotches. The only thing I'm not 100% happy with, is that the dye is maybe a little more yellowy than the original colour. 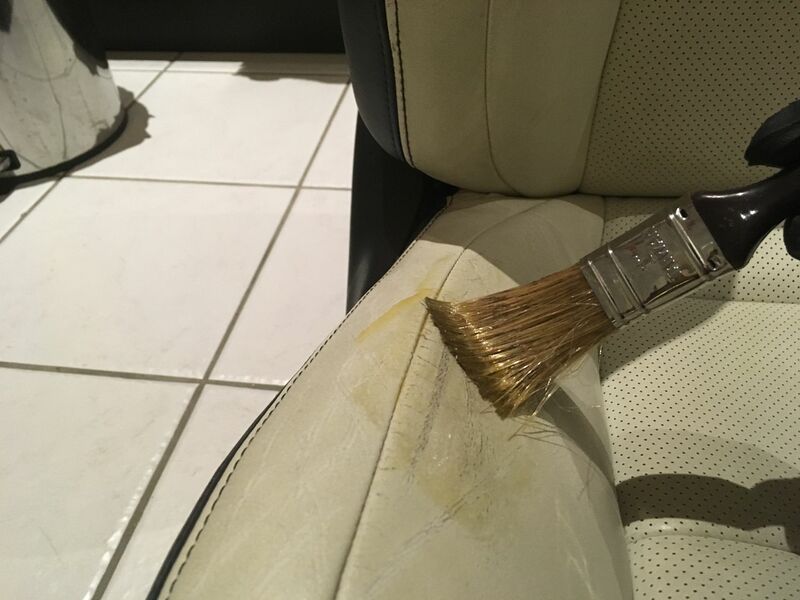 When the guy mixed up the colour, we smudged a little onto the seat and the colour match looked spot on, so maybe I didn't shake or stir it enough. But then again, this is in my kitchen under downlights and sitting on white tiles, so perhaps it isn't noticeable once it's in the dark cabin. The old spray repair was actually more brown than it should be and wasn't noticeable, so fingers crossed. And...it'll be 48hrs before I can sit in it As to whether this repair lasts, I guess we'll see. But the fact that the foam is back to its old self again means we have a significant head start. In tonight's episode of More OCD With Leather For Fun & Profit, we finish what we started. After the last bit of restoration on the driver's seat, it looked pretty good in the sunlight, where the colour seemed a good match. 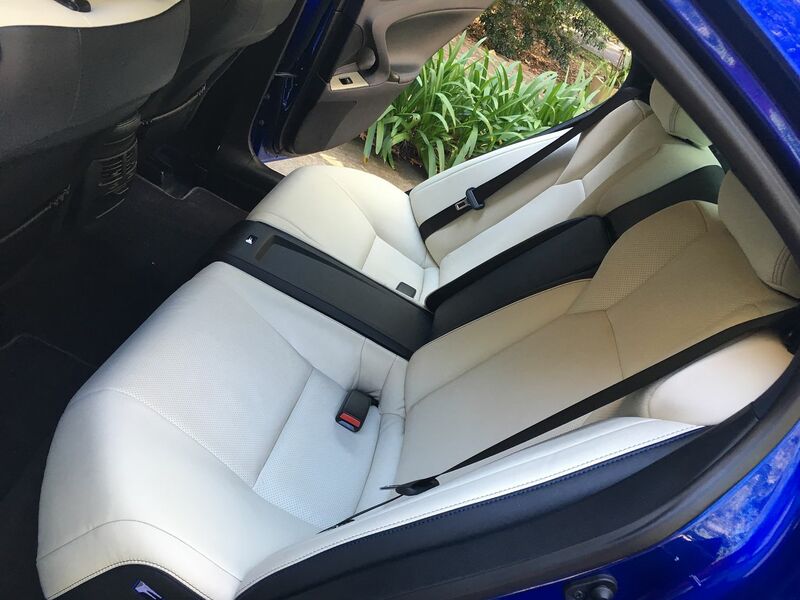 But before we can move on from the driver's seat, there is something that needs finishing that we couldn't do with the rest of the seat. 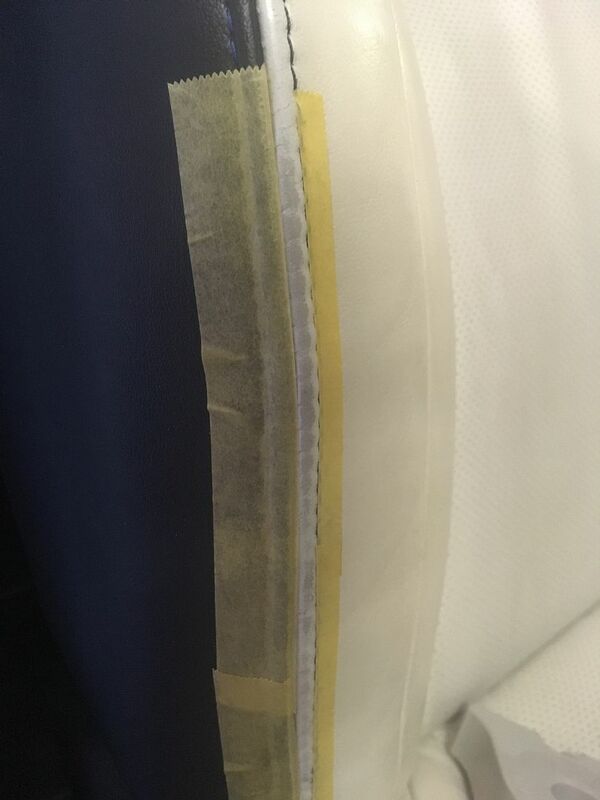 The piped edge of the side bolster had a little wear in the colour, and as fixing it requires that stitching to be masked from the other side (the side that we were fixing), it had to wait until the main repair was dry and cured. 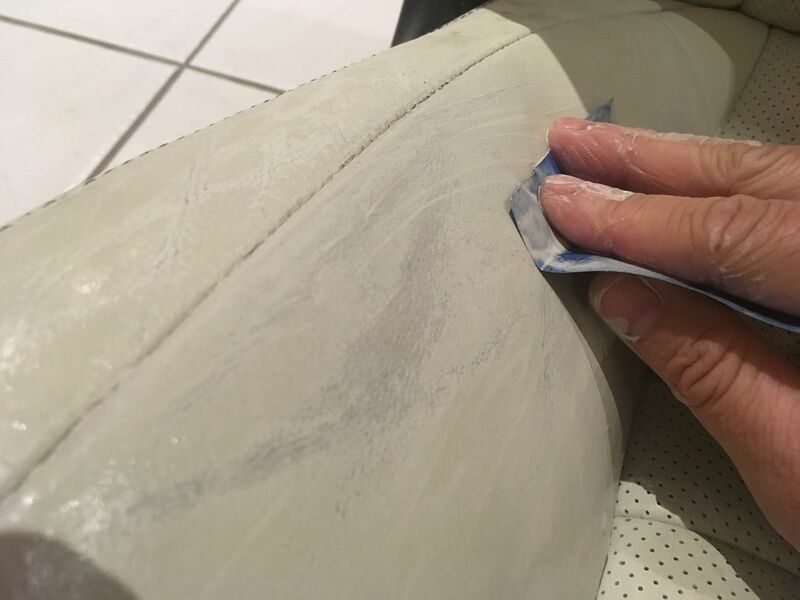 The leather was cleaned and treated along with the rest of the seat, so as before, the next step is to sand away the damaged dye with 600 grit paper and the Leatherique Prepping Agent. Since we're just dyeing a very narrow strip, I'm doing it with by dabbing on the dye with a cotton bud. 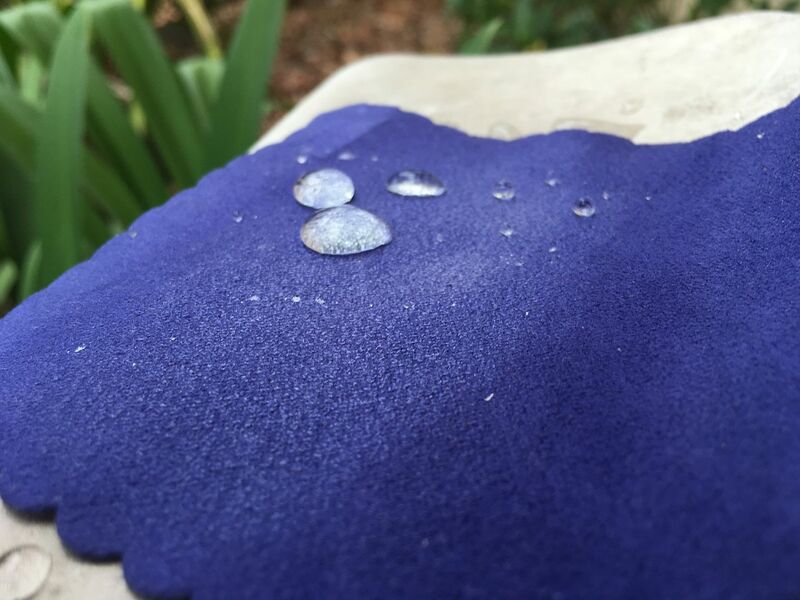 I found that if you sanded all of the old dye down to the parent leather, the new dye gets soaked up very fast. And after a few coats, it's looking good again. First step is the Rejuvenator moisturising fluid. You'd think that you'd clean it first and THEN moisturise, but Leatherique do it the other way around. 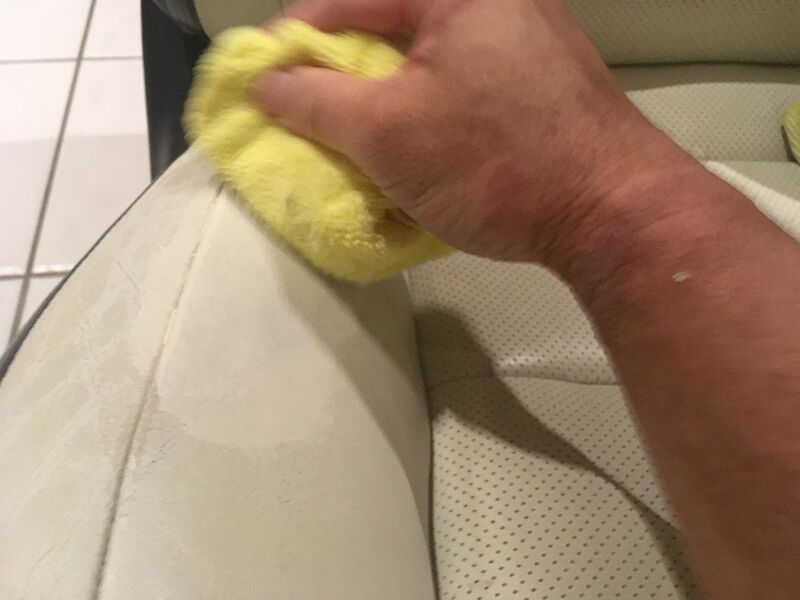 So the sticky oily fluid goes onto the leather with a brush. 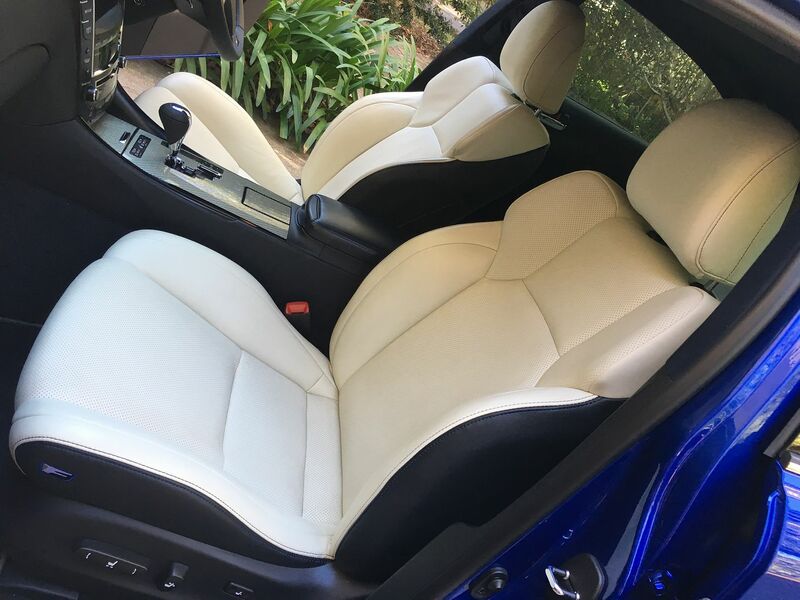 It absorbs better in the heat, when the fluid becomes thinner, so i roll up the windows and idle the car for 20mins with the heater on full blast to at least get "some" heat in there. The next day, some of the stuff has been absorbed, but as the other seats are in actually pretty good shape, they didn't have any high-wear areas that soaked up all of the fluid. 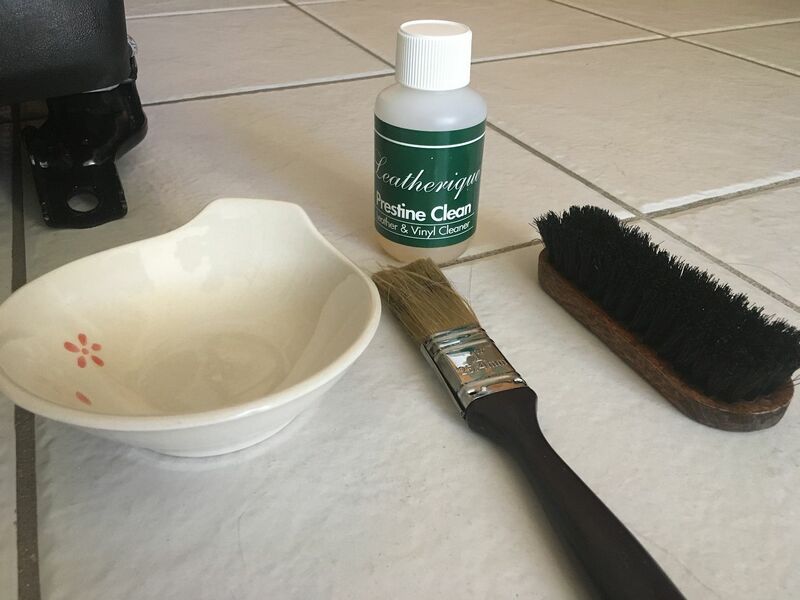 The Prestine Clean is then sprayed on, given a quick scrub with a leather brush and then is wiped down with a damp cloth (that you have to keep rinsing out in a bucket of hot water). But...you can't argue with the result. 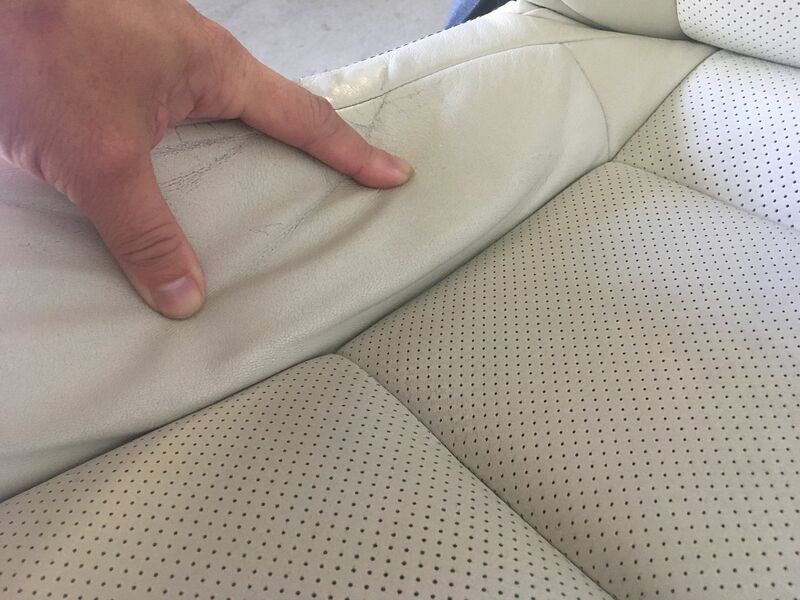 By moisturising first and cleaning later, there is no greasy sheen to the leather and it's really dry, clean and noticeably fatter and softer to the touch. 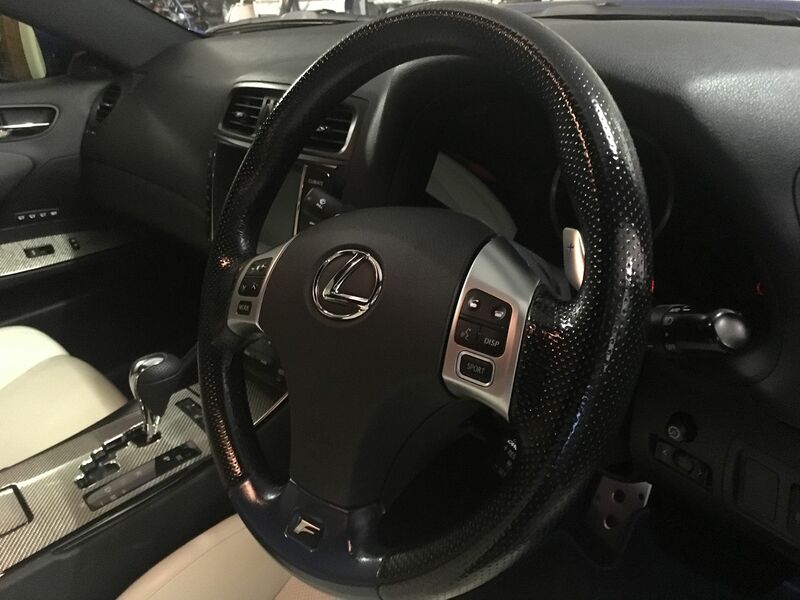 The last job (I promise) is to see if I can knock the shine off the steering wheel. 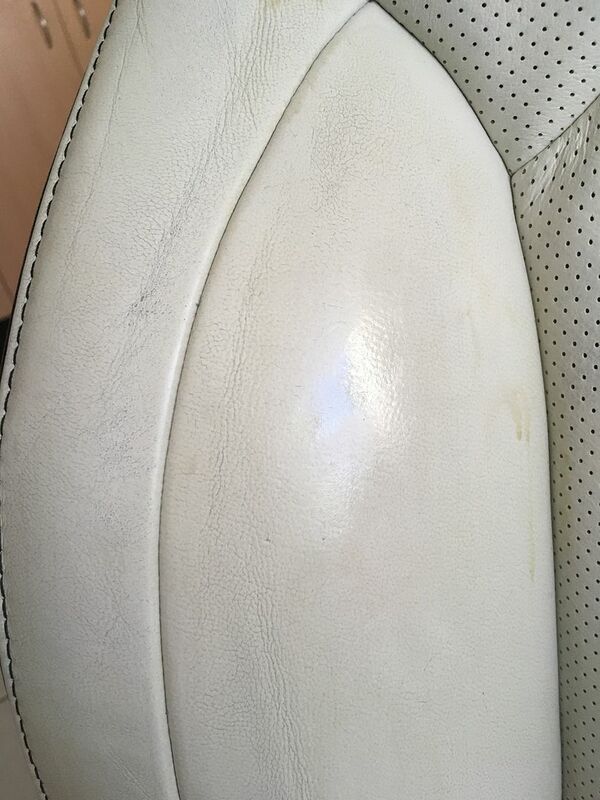 Now, I reckon that some of the shine is due to the mechanical polishing of the leather by your hands over the years. But I reckon at least some of the shine would be from crap on your hands being embedded into the leather and polished, too. So on goes the Rejuvenator moisturising fluid to sit overnight. It's meant to soften the dirt and oils and make it come off when you do the cleaning step. Next day, it doesn't look like much of it has been absorbed at all. But I figure it might become more absorbent if I give it a good clean and repeat the process. So it gets a good scrub with Prestine Clean and the brush, before the Rejuvenator goes on again for another night. 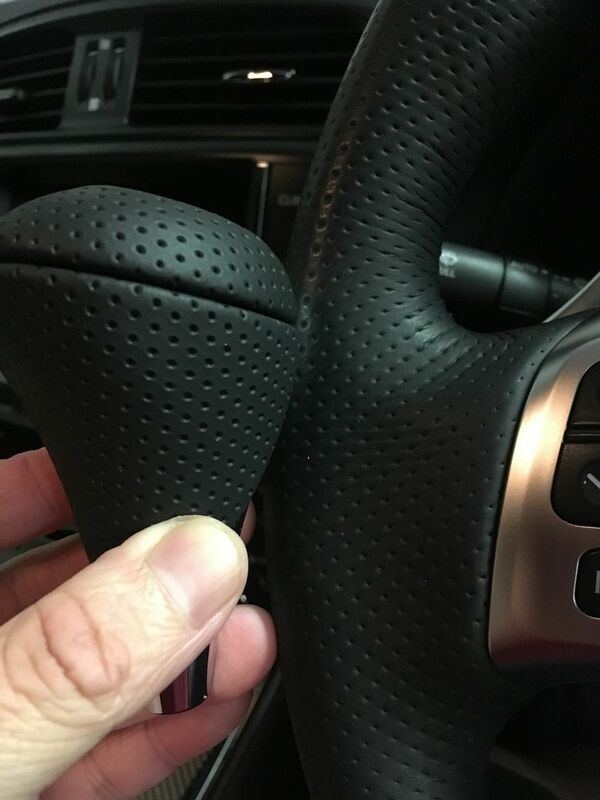 Next day, it does seem to come out better after the clean, and in the low-traffic areas, the shine is totally gone; pic of a brand new gearknob for comparison. 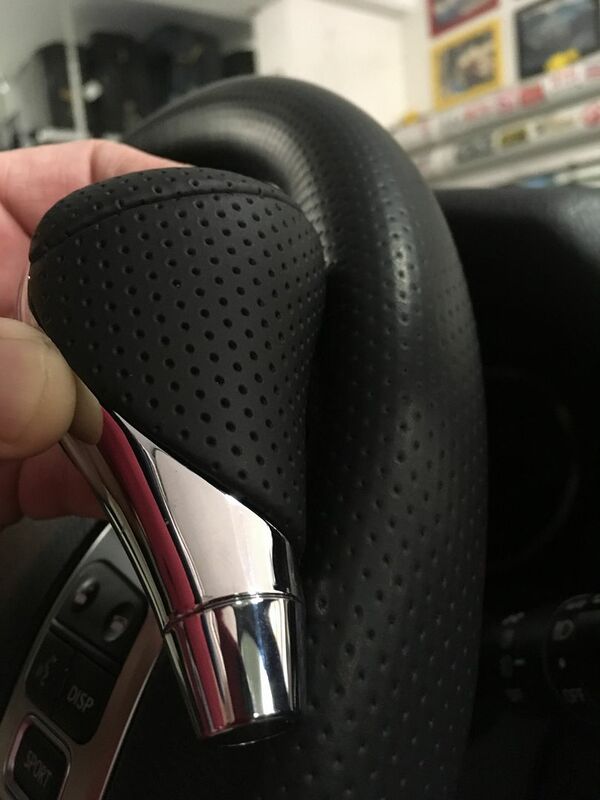 On the higher-traffic areas like the outer rim where your right hand goes, I'd say 70% of the shine is gone, and the wheel is noticeably softer and squishier to hold. Nice work. Please keep with the updates. Many still lurk around here! 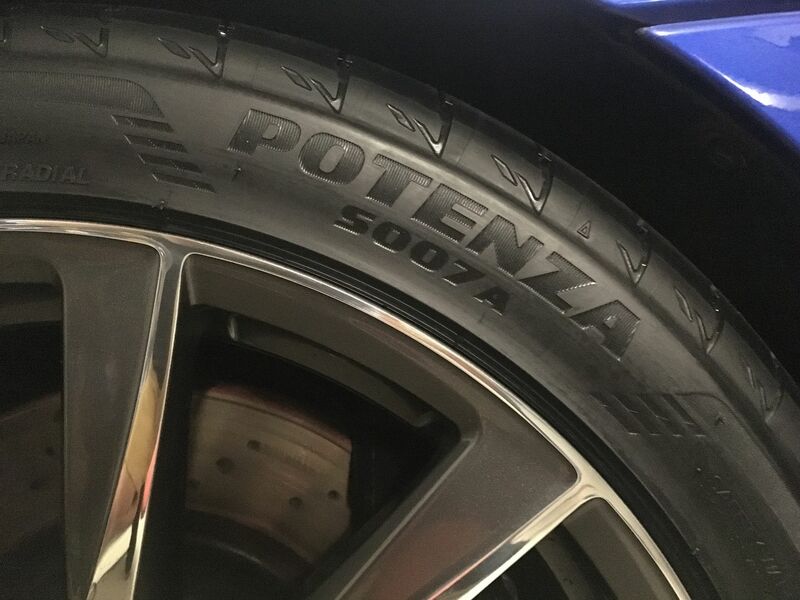 Recently Bridgestone were kind enough to send me a set of their new Potenza S007A to try out. They're based on the S007, which Bridgestone developed as the oem tyre for the Aston DB11; so these are their latest offering for high-end supercar tyre market, and sits at the top of their road tyre range. 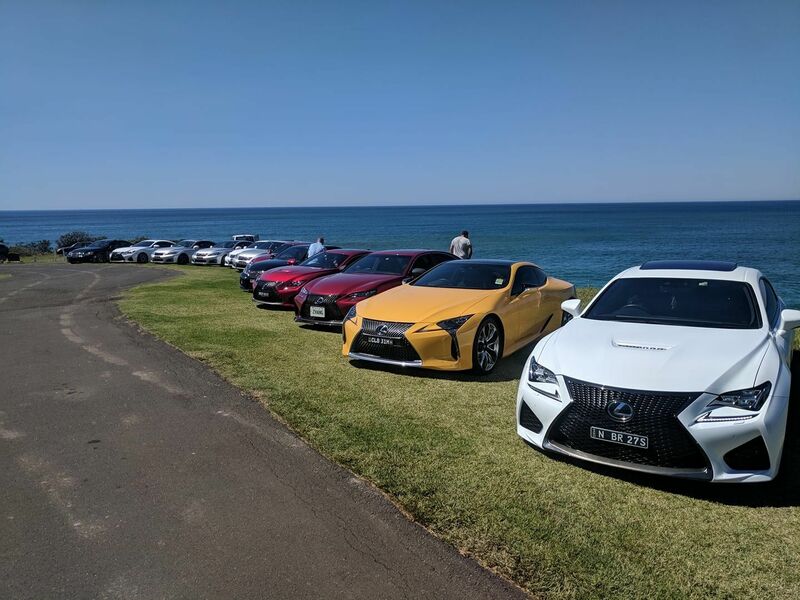 They're aimed at owners of Lexus F, AMG and M-cars, so I was pretty curious as to how they'd go. 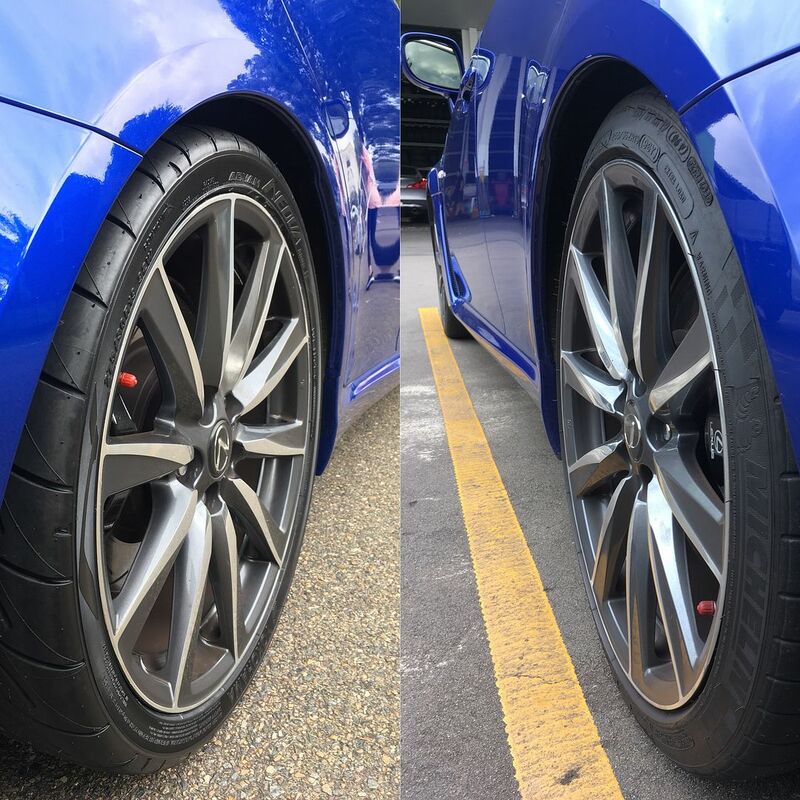 Once they were fitted, I immediately noticed that compared to the Advan AD08Rs, road noise was much less noticeable and the new tyres rode with a bit of a plush edge. When pushed on a winding road, the steering was bit calmer and less alert, but the breakaway characteristics were quite soft and gradual. So they give you a lot of feedback and you feel more comfortable really leaning on the tyres. Wet grip was an improvement on the AD08Rs, and dry grip was about the same on the street. So as a pure road tyre, I'd say that I like them a lot; they feel exactly like a premium luxury sports tyre should. 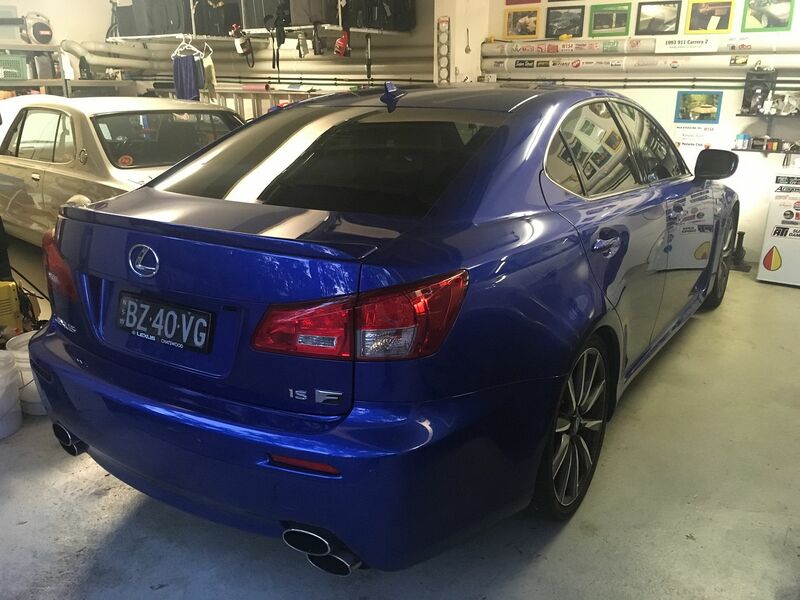 But the other piece of the puzzle, is how they go on the track, so without further ado....the ISF and I head to Wakefield Park. When I first got the ISF, she did 1'10.2 on the oem fitment 225/255 Michelin Pilot Super Sports. I then fitted Advan AD08R in a wider 245/275 size, and the laptime dropped to 1.09.6. So I'm pretty impressed that the Bridgestone S007As managed to beat that by a few tenths. But straight from the first run, it was easy to get into the 9s, the grip level felt great straight away and there wasn't any warming up needed, and they kept the same soft breakaway characteristics from the street, so it was easy to get stuck into it straight away. You can see in the in car vid that you can hang it out there and have the car constantly sliding a little, and there is enough predictability to avoid making (too many) mistakes. But this is where it gets interesting. 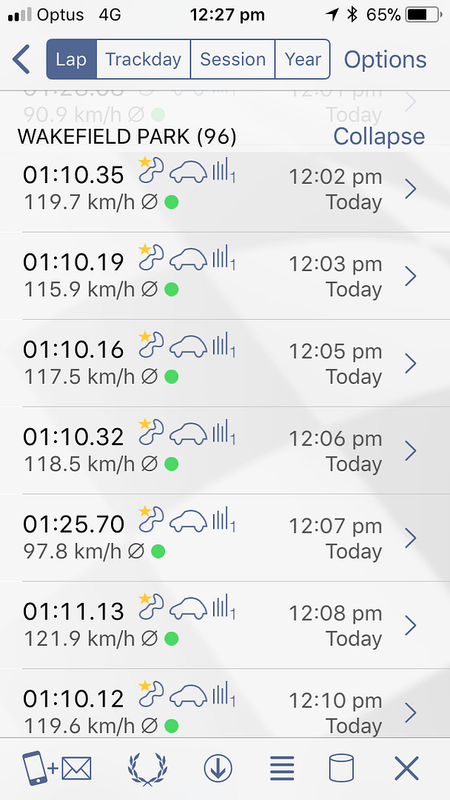 I'd been experimenting with tyre pressures all day, and the S007A's unusually seemed to be fastest with a fairly low pressure of 35psi hot. I tried raising the hot pressures to 37 and 40psi, and times fell to 1'09.6. And all throughout the day, I did notice that the rate of wear was higher than I would have expected, and the stiffer pressures didn't really make any difference. They were fastest on the first three laps of each session, and after that the laptimes would start to worsen as they heated up, and they needed about 3 cooldown laps before they were good to go again. In that sense, pretty similar to the Michelins. I think the thing with these S007As are that they have quite a soft compound, with a treadwear rating of 240. So quite a bit softer than say a Michelin Pilot Super Sport at 300 but harder than the AD08R at 200. But subjectively, the S007As do feel softer and gummier than the Advans. This explains the great grip and feel, but also the high wear rate. I've only had them for a few weeks, so I can't say what their longevity is like on the street, but they looked perfect after a winding road thrash, so I suspect you only burn them up when you're on the circuit. 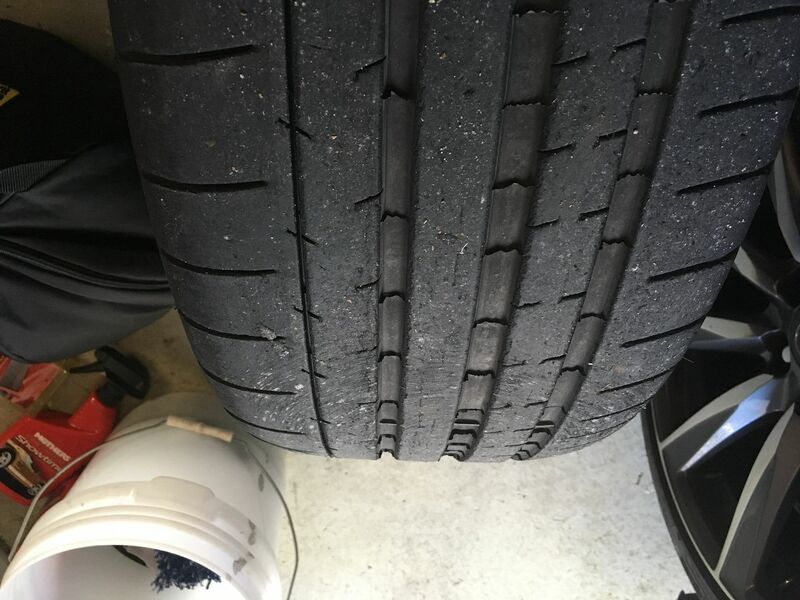 So in the end, I find myself in a strange position of having these tyres which are capable of a great laptime, but aren't actually that well suited for trackday use. But as a pure road tyre, they're really, really good. Great info on a new tyre, and great back to back comparison against the supposedly best street 'semi' tyre! Another week...another trackday at Wakefield! 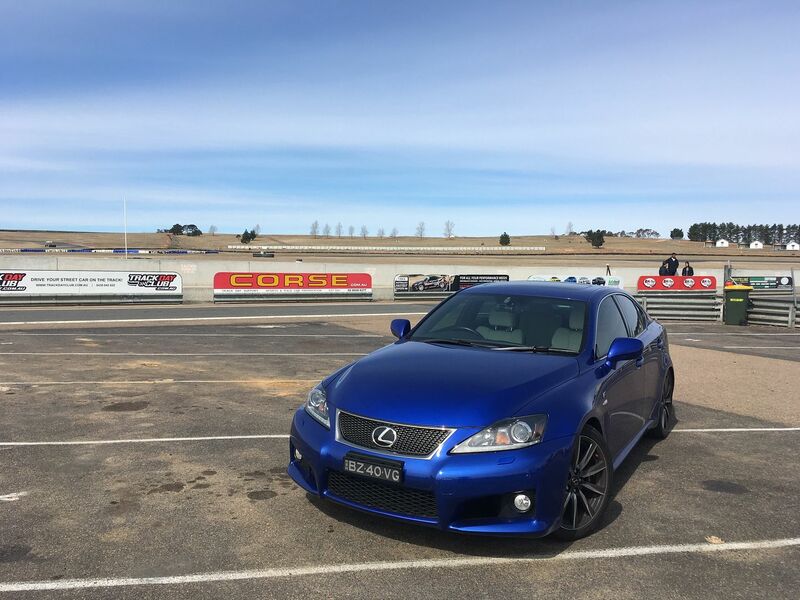 This time, it was a trackday with the Lexus F Owners Club, which was part of a timed day with Trackschool. Yes, yes it was only two weeks ago that I last went to Wakefield; where we scored a new PB on the Bridgestone S007As. 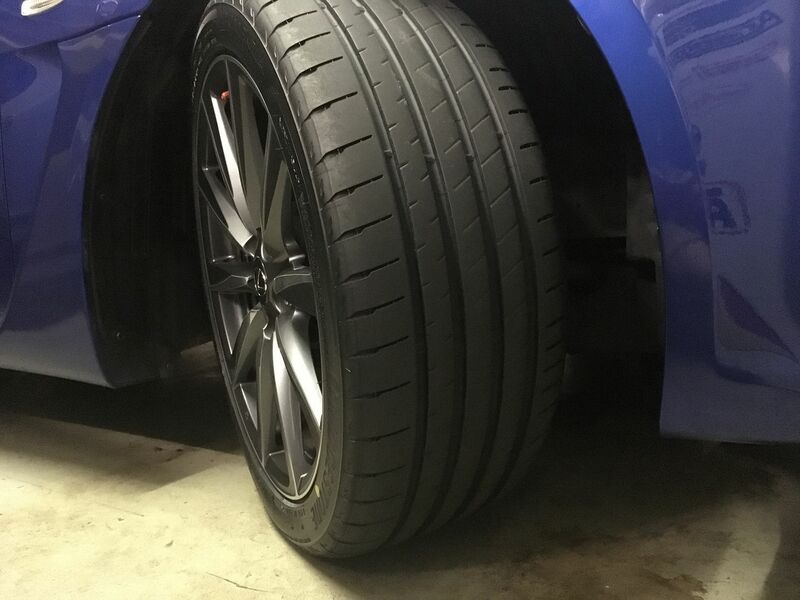 Since then I've refitted the Advan AD08Rs as they're more suited to continuous lapping, so I was hoping to at least match the 1'09.3 that I got on the Bridgestones. 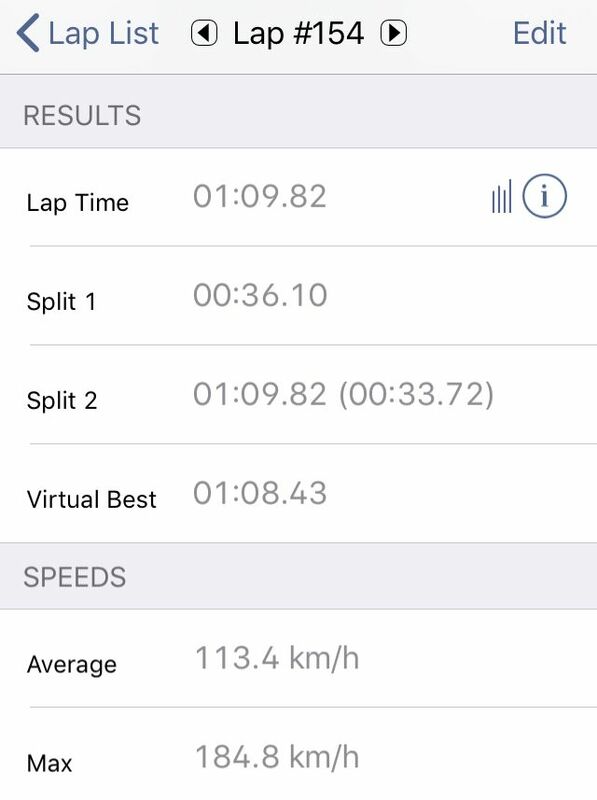 But alas, it was not to be and the best I did was a 1'09.8, which is in the ballpark of my PB on Advans of 1'09.6. 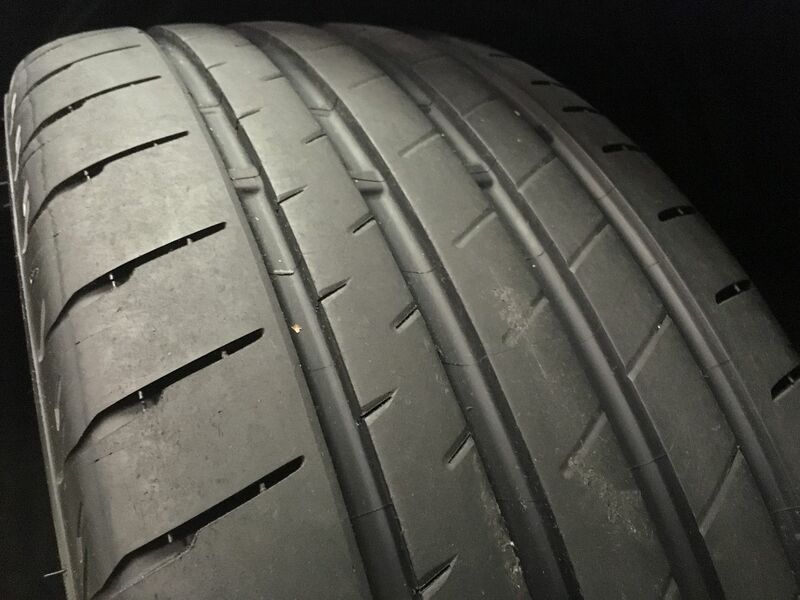 The AD08Rs wore nice and evenly (unlike the Bridgestones) and were nice and consistent all the way throughout each session, but I did notice that it was harder to get a time out of them. With the S007As, they felt like they were at their peak on the first corner after coming out of the pits and I was into the 1'09's straight away. But with the Advans I have to work up to it and it seems like a bit of an achievement when I do finally crack into a 9 halfway through the day. The S007As feel like a road tyre, with a squidgy, soft edge to the grip limit; so I can get right into it and I know where I stand. The Advans are more of a racy tyre with a more distinct edge to the grip. Looking at the in-car footage, it does look like I'm fidgeting and correcting the car a lot more than I was a couple of weeks ago. Now I'm wondering if it's my driving style I have to change. The ISF points quite well into a corner, but between turn-in and the apex, it does wash away into understeer a tiny little bit. And in the two critical corners (the 90 degree right hander off the main straight and the sweeping right hander on the back straight) you can hear that I'm quite late onto the throttle, as I'm waiting for the front end to settle. In the tighter corners, you can get onto the power early and bludgeon your way past the apex with oversteer but I think I am losing quite a bit of time in the faster stuff. It would be nice to add some front camber (which isn't adjustable ) but maybe I need to rethink my approach and take a slower entry, turn in earlier and power on earlier. It has occurred to me that maybe I'm just overdriving it. So I reckon I still haven't quite worked out how to drive this thing yet, but it did okay in the results. 10th overall out of 65, just pipped by a C63S and a well-driven M140i.